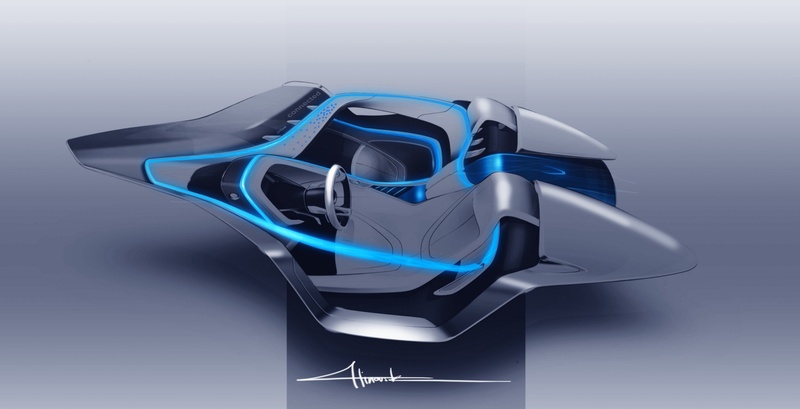 H BMW παρουσίασε στη Γενεύη το Vision ConnectedDrive concept. Θυμίζοντας αρκετά Vision EfficientDynamics, το πρωτότυπο διαθέτει μεγάλη μάσκα με μεγάλες εισαγωγές αέρα, παρμπρίζ χωρίς πλαίσιο που ξεκινά από τα μέσα του καπό καθώς ηλεκτρομηχανικές πόρτες που θυμίζουν αυτές της Z1. Το εσωτερικό είναι χωρισμένο σε δύο μέρη με την κεντρική κονσόλα να φτάνει μέχρι πίσω και να διαθέτει ελάχιστα κουμπιά ελέγχου. Ξεχωρίζει η Head-Up Display που προβάλει όλες τις βασικές πληροφορίες του αυτοκινήτου καθώς και ο ηλεκτρονικός πίνακας οργάνων. 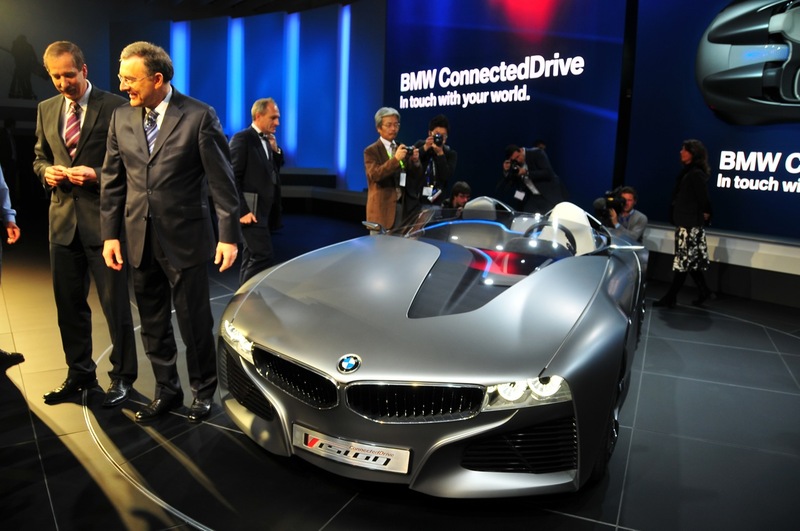 Σε ότι αφορά το ConnectedDrive μέρος, η BMW φαντάζεται ότι μέσω του smartphone του, ο οδηγός θα μπορεί να έχει πρόσβαση σε όλες τις εφαρμογές του μέσω αυτοκινήτου συγχρονίζοντας τα πάντα, όπως μηνύματα, επαφές, mail κτλ. Αν τα παραπάνω σου φαίνονται ξεπερασμένα, θα σου πω ότι το σύστημα μπορεί μέσω των πληροφοριών που προβάλλονται στην Head-Up Display να οδηγεί το αυτοκίνητο μόνο του, χωρίς την επέμβαση του οδηγού. Παραδείγματος χάρη, βρίσκεις ένα εστιατόριο που δεν έχει πάρκινγκ, μην σκας πλέον το αυτοκίνητο θα βρει το κοντινότερο πάρκινγκ μέσω internet και θα πάει να παρκάρει μόνο του χωρίς να είσαι εσύ μέσα! 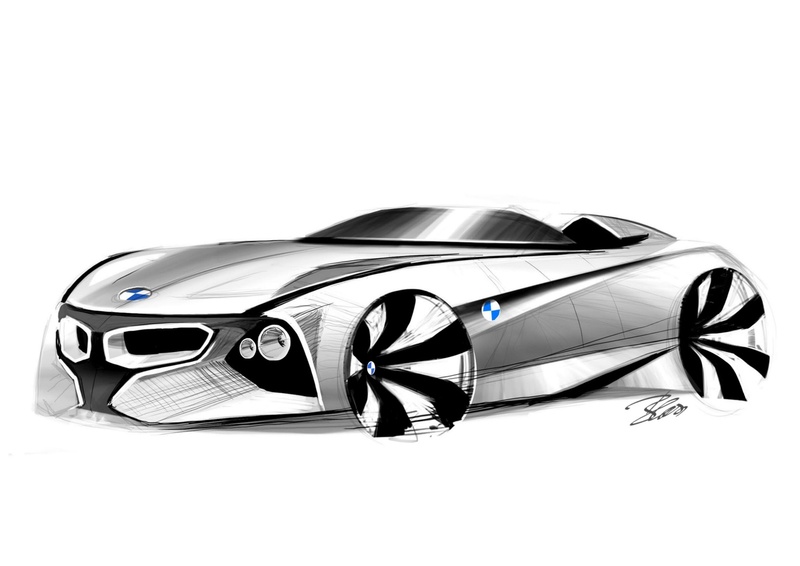 Η BMW ανακοίνωσε επίσης στη Γενεύη το πακέτο Design Pure Balance για την Ζ4. Το πακέτο αυτό διαθέτει νέες δερμάτινες καφέ επενδύσεις στο εσωτερικό με λευκές ραφές, ξύλινες ανθρακί επενδύσεις και sport τιμόνι. Εξωτερικά είναι βαμμένο σε ένα νέο λευκό μεταλλικό χρώμα (Mineral White το ονομάζει η BMW). 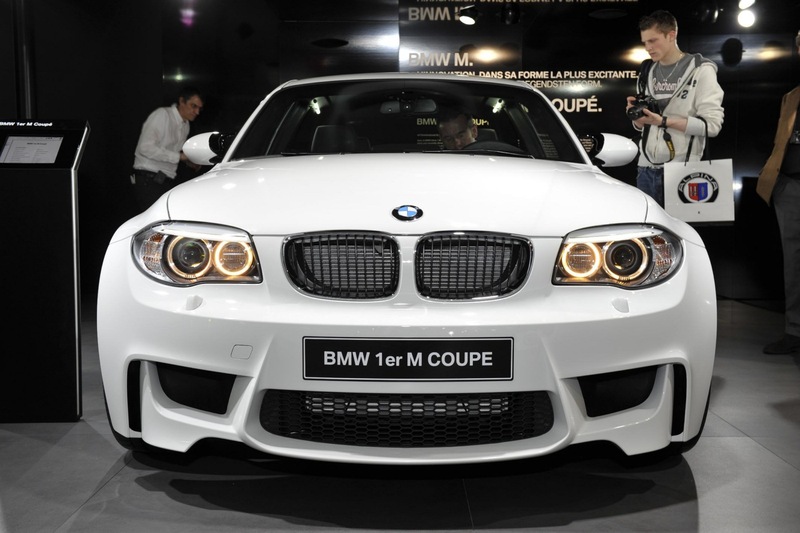 Στο περίπτερο της BMW βρίσκονται επίσης η 1-Series M Coupe και η X1 xDrive28i με τον νέο turbo δίλιτρο κινητήρα. Μεγάλη gallery στη συνέχεια. Munich. 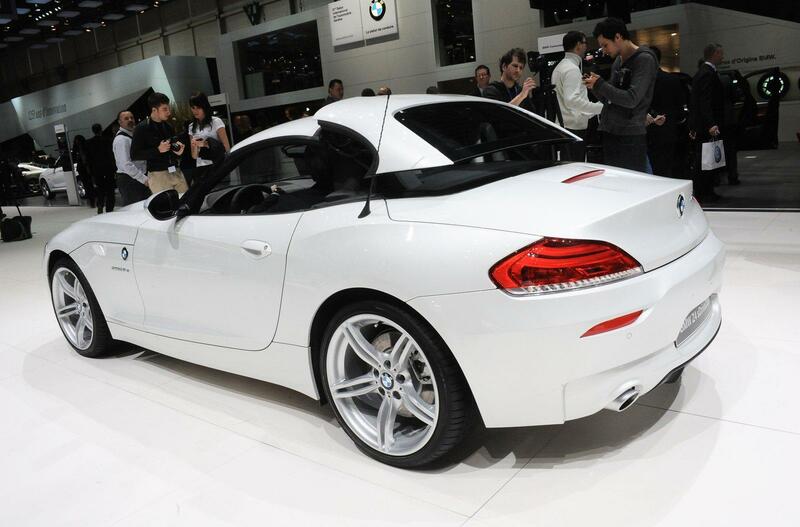 A further interpretation of the successful BMW Z4, the leader in the premium roadster segment worldwide, can be seen at the Geneva Automobile Salon 2011. Here, the new equipment package Design Pure Balance is on show, specially tailored by designers to suit this successful model. The interior has been generously fitted with leather in the attractive new colour Cohiba Brown, with contrasting seams in Lotus White. The package is rounded off with additional black leather features featuring seams in Umbra, Fineline Anthracite wood and sports seats as standard. 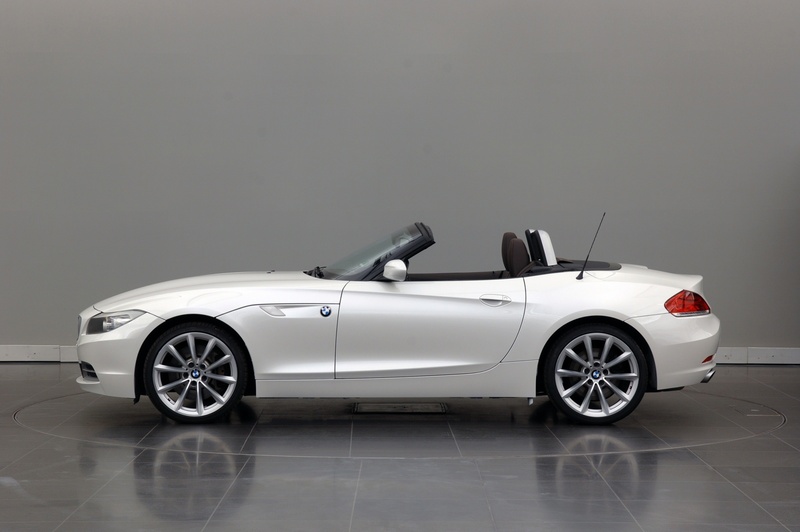 The paint finish Mineral White metallic is also available for the first time in the BMW Z4, exclusively in connection with the new package Design Pure Balance. Thanks to its fine metallic pigmentation it leaves a brilliant impression in the true sense of the word. 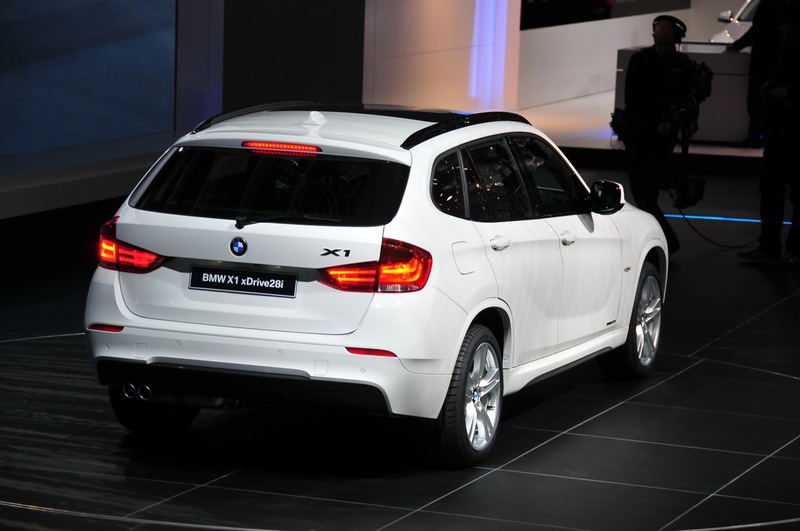 Alternatively, the new package can also be combined with other non-metallic and metallic exterior paint finishes. The new equipment package can be ordered from summer 2011. 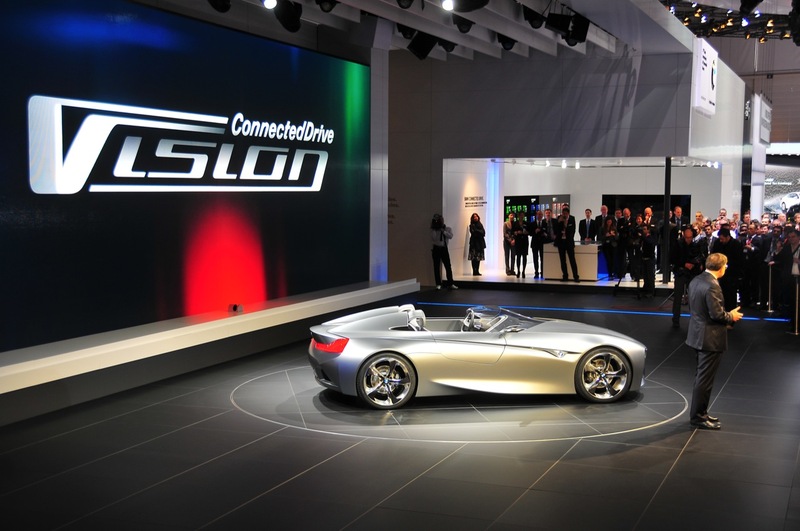 The future of intelligent networking: The BMW Vision ConnectedDrive. At the beginning of the 1970s BMW began work on networking the vehicle with the outside world and networking the vehicle’s own systems with each other in order to realise innovative information, communication and assistance systems. 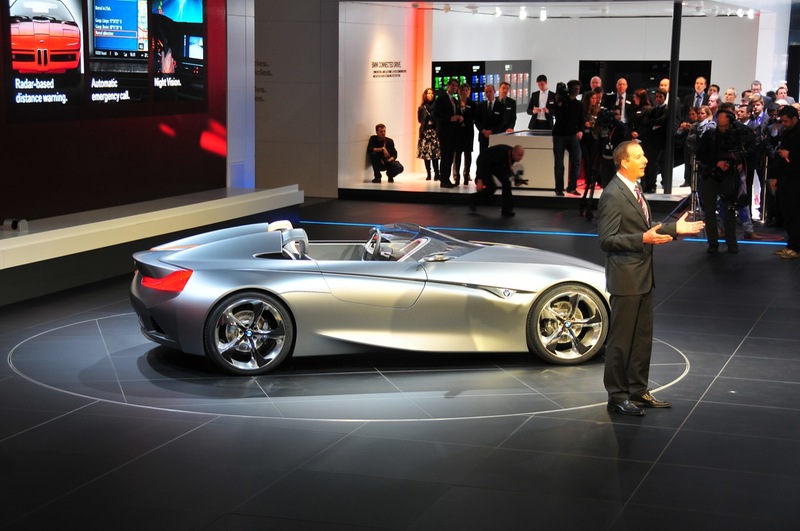 Since those early days, enormous progress in networking has been made – progress that was primarily driven forward by the creative, innovative strength of the BMW Development Engineers. 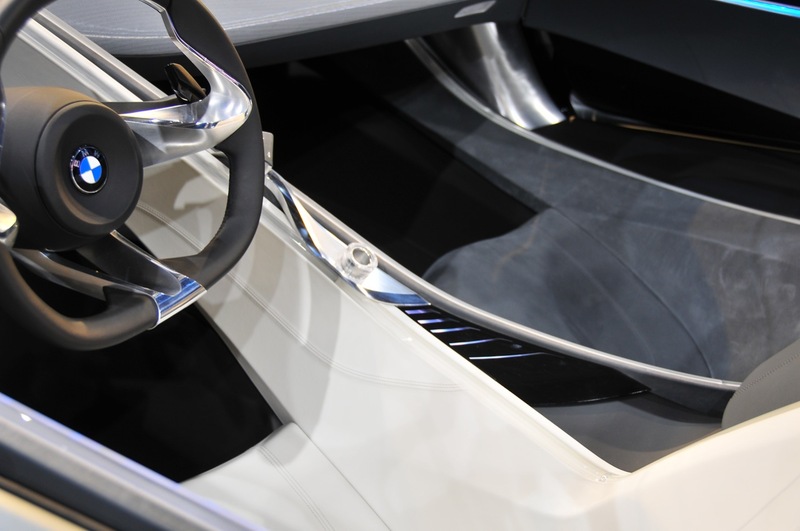 Many of these innovations such as the Park Distance Control or the Integrated Navigation System have set standards for the entire automotive industry. 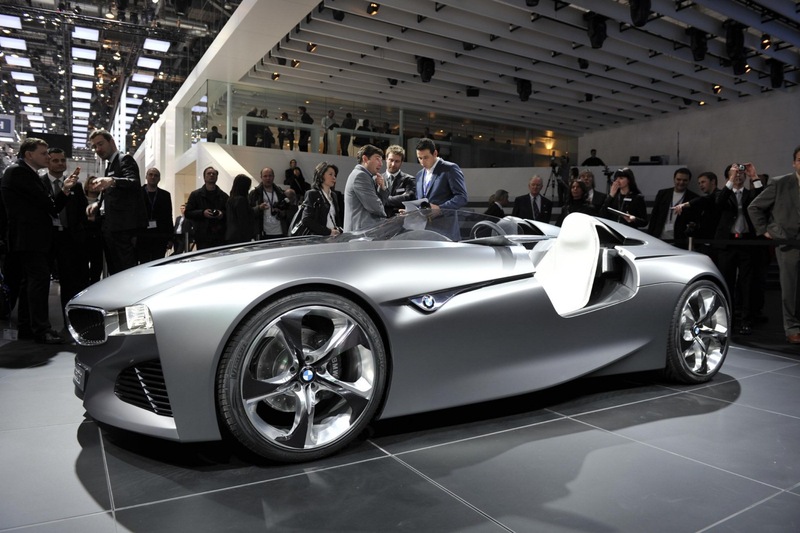 The BMW Vision ConnectedDrive concept study extrapolates the principle of intelligent networking of driver, vehicle and the outside world into the future. The vehicle is transformed perfectly naturally into a fully integrated part of the networked world and sets new standards in future comfort, infotainment and safety features. 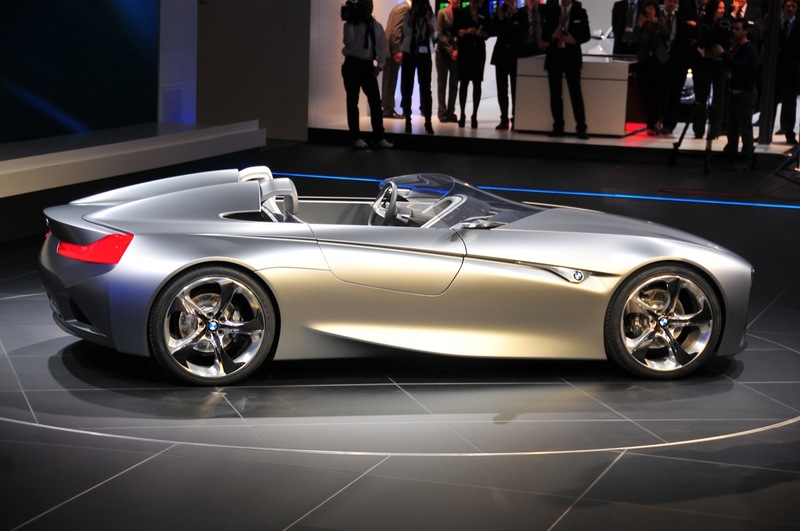 The BMW Vision ConnectedDrive shows most impressively the potential that BMW ConnectedDrive technologies hold for the future. The concept study should be viewed as a sculpture, as a vision, giving these innovative technologies and forward-looking ideas physical form, portraying them and breathing life into them. Please visit www.visionconnecteddrive.de on the Web or www.visionconnecteddrive.mobi via a mobile device for visual impressions and detailed information on the BMW Vision ConnectedDrive. Design expresses networking – the creation of the connected vehicle. 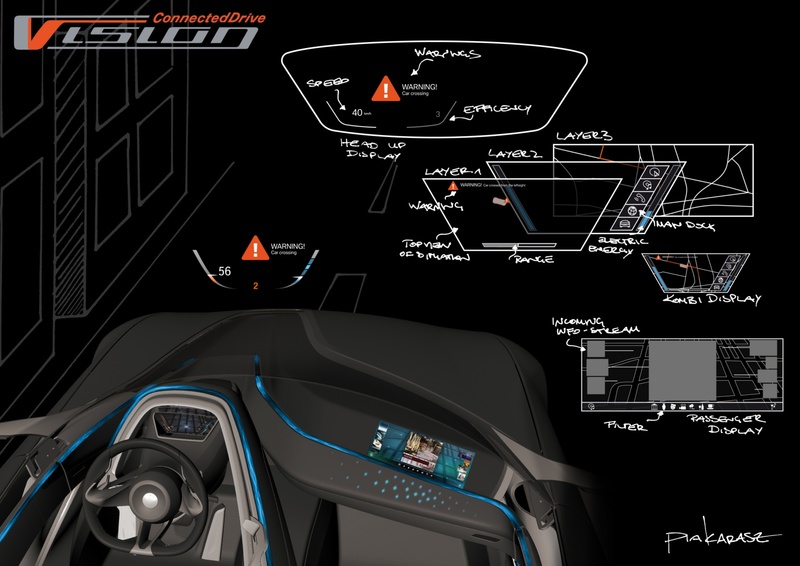 The overall theme of the emphatic design of the BMW Vision ConnectedDrive vehicle is “connect and network” and is divided into the three areas of safety, infotainment and comfort. 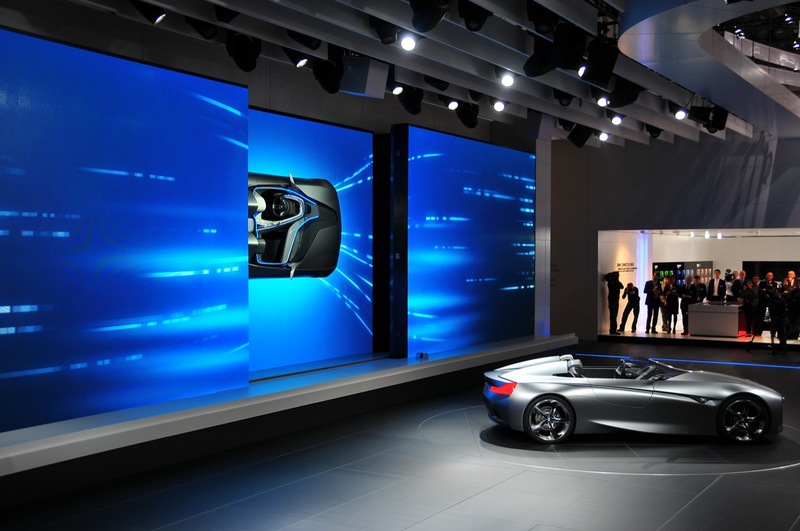 The fundamental concept of BMW ConnectedDrive – the intelligent networking of driver, vehicle and the outside world – is expressed on four levels: the display and operating concept, an unparalleled light installation, the design itself and the integration of the whole concept into the multimedia setting of the stand at the motor show. 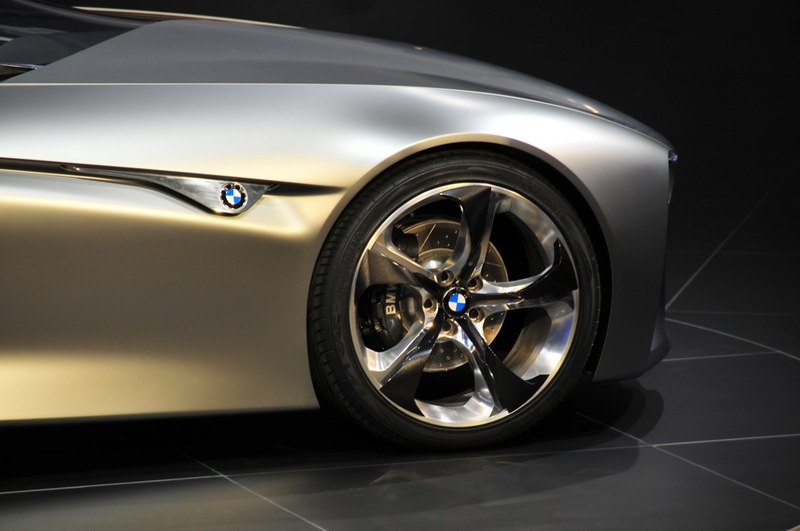 The human being stands firmly in the focus of BMW Vision ConnectedDrive, more so than with any other vehicle. The vehicle and its functions have been designed to cater to the needs of the driver and the passenger – they are the starting point and the end of each and every interaction. This orientation towards the passengers is most obvious in the interior. Clear, enclosing symbolism divides the interior into three levels that could also be described as layers or shells. Each level expresses one of the three themes of BMW ConnectedDrive – comfort, Infotainment and safety – and integrates the appropriate functionality, operating panels and displays. 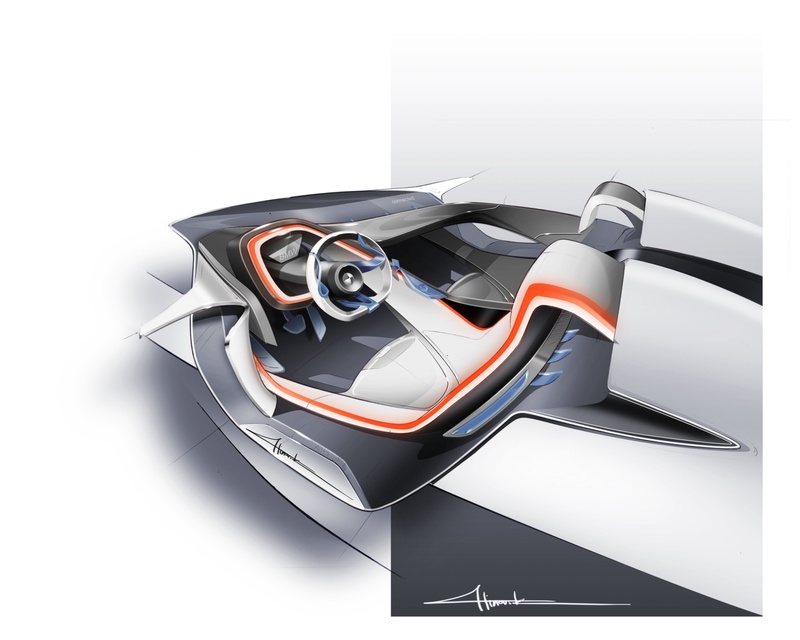 By creating the three layers in the BMW Vision ConnectedDrive’s interior, the layering principle, something also well known from BMW Vision EfficientDynamics, has been consistently further developed. 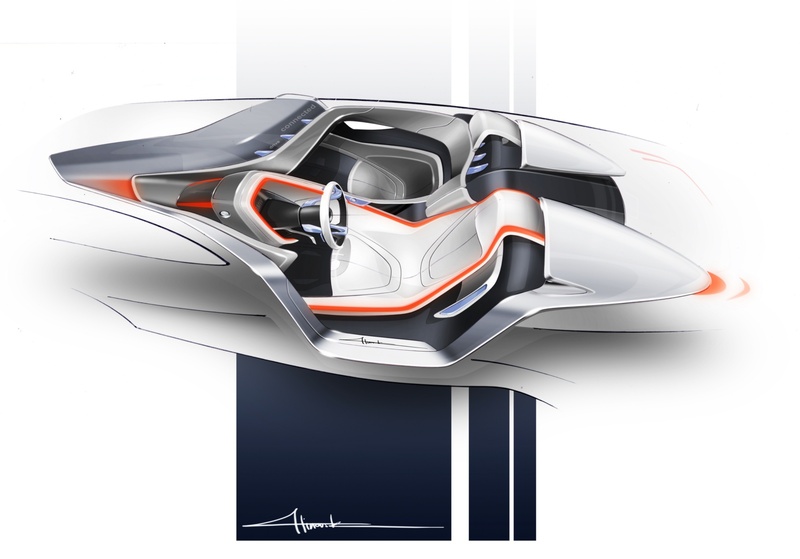 The term “layering” describes a new approach to the BMW Group’s concept of design and its design language, redefining the way surfaces, interfaces and materials have been treated in the past. By working with different layers, organic radii and surfaces, the layering concept breaks up large volumes like the instrument panel, thus creating free space for features such as ventilation, operating elements or trays. The result is a modern, organically aesthetic, light and emotional design. Safety – focussing on the vehicle’s primary task. The safety layer bundles all of the information and operating elements relevant to driving the vehicle as is characteristic and typical of BMW’s driver orientation. This is where the two instruments that provide the driver with access to the entire spectrum of relevant information are located. The windscreen is an integral part of the Head-Up Display and provides important current information about the journey – including speed, navigation instructions and fuel consumption – to the driver without him ever having to take his eyes off the road. In addition, if required, the freely programmable instrument cluster located in the scoop will provide extra in-depth information to supplement the Head-Up Display. Infotainment – connection instead of isolation. The Passenger Information Display is mounted in the instrument panel in front of the passenger and is the gateway to the passenger’s world of entertainment. When it is inactive, it is invisibly integrated into the instrument panel. However touching the area below, which is covered with a transparent, conductive fabric, will bring it to life. Using the touch-sensitive area, the Infotainment features on the display can be manipulated and controlled at just the touch of a finger. Light sources in the fabric glow when touched and provide the passengers with feedback on their actions, i.e. the vehicle interacts with the passenger. 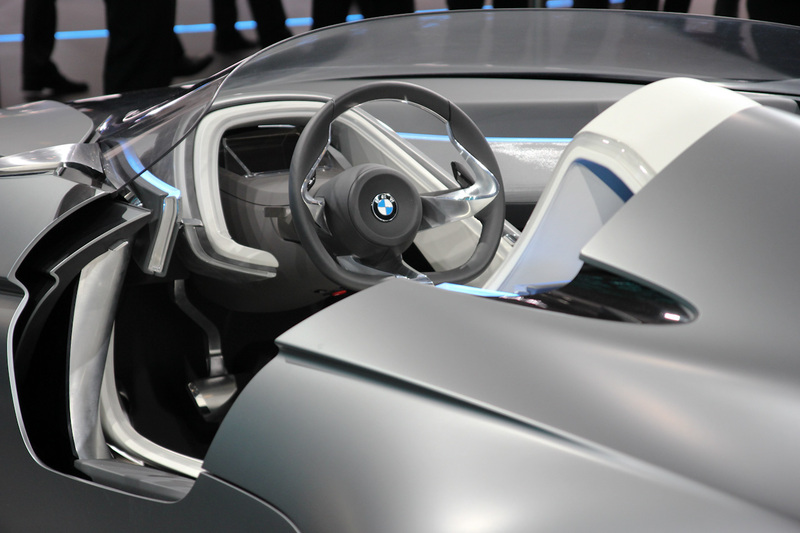 The antenna, which can be seen under a Perspex cover in the middle of the vehicle behind the headrests, is the link between the BMW Vision ConnectedDrive and the world of Infotainment. This antenna does a very similar job to the well-established fin-shaped antennas mounted on production cars. 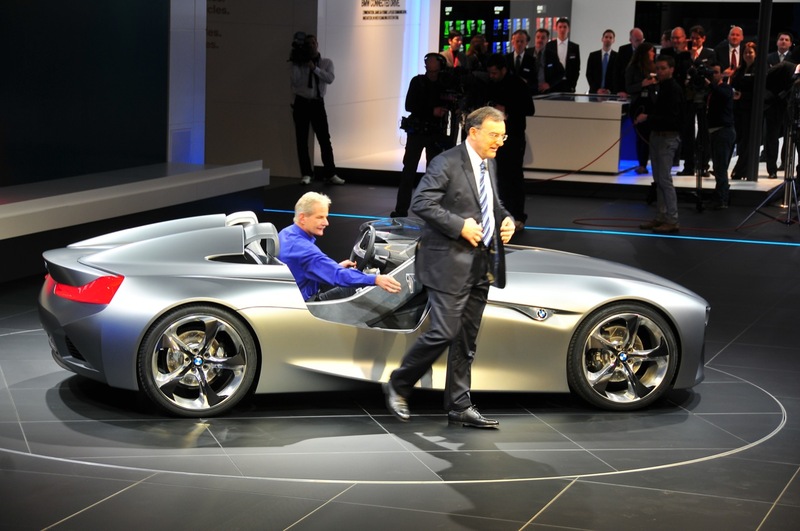 Comfort – communication between the vehicle and the environment. 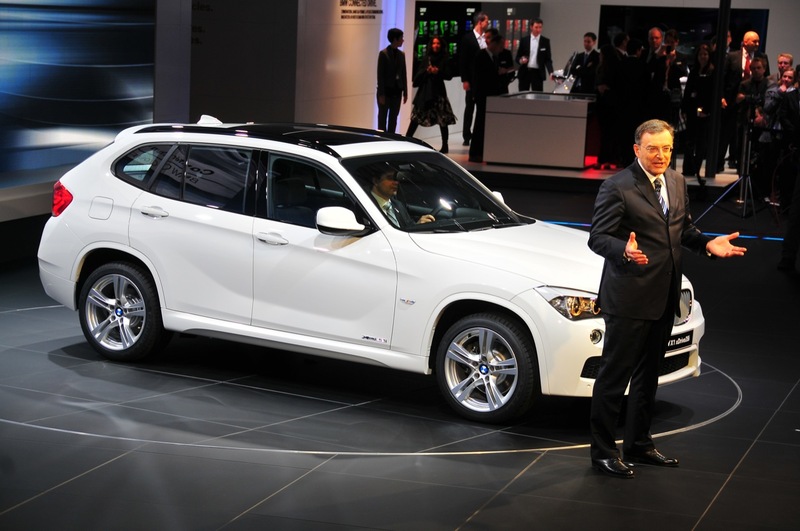 The third level comprises the vehicle itself and focuses on the communications level of the two passengers and the outside world, something central to BMW ConnectedDrive. 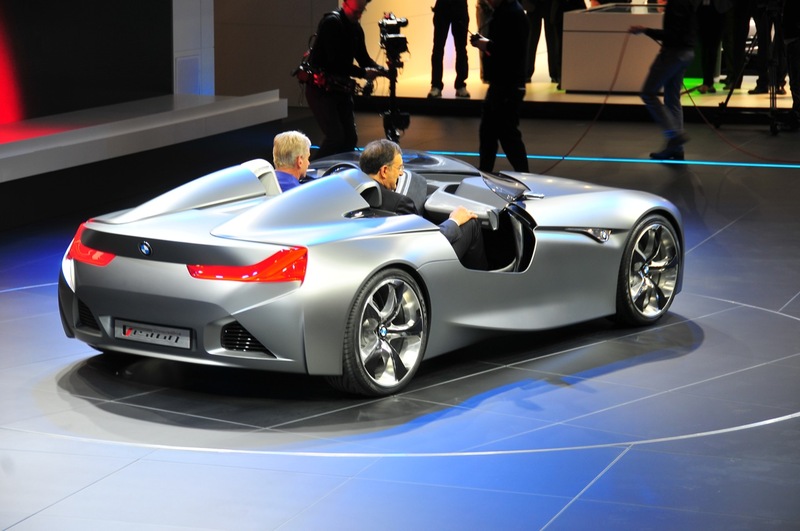 In the BMW Vision ConnectedDrive, the connection between the vehicle and the environment is expressed primarily in the peripheral zone of the automobile. 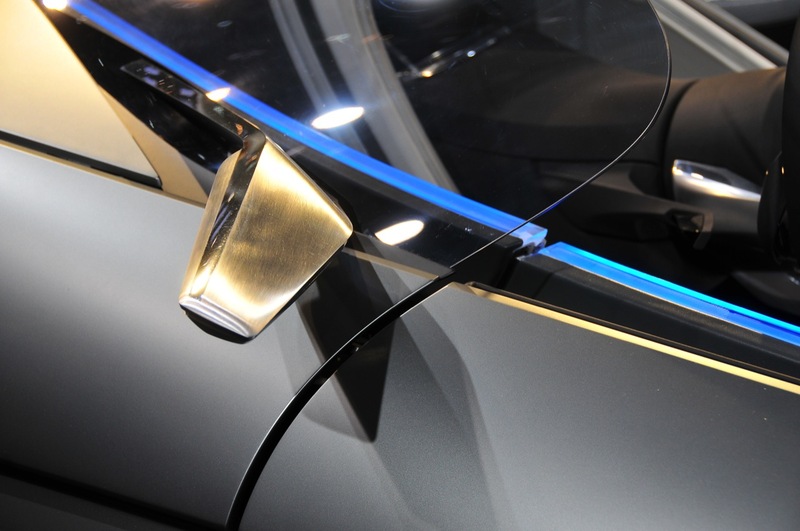 Instead of two wing mirrors, two fin- shaped antennas provide the link to the world of data. No matter whether navigation and traffic information or mobile Internet, these antennas either pick up information relevant to the comfort of the passengers and channel it to the interior of the vehicle or they transmit information to the outside world. 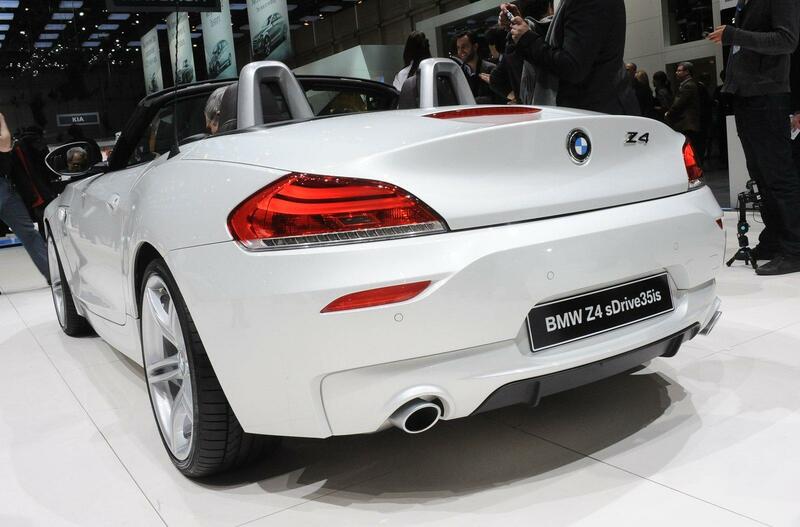 The exterior design – a true BMW. 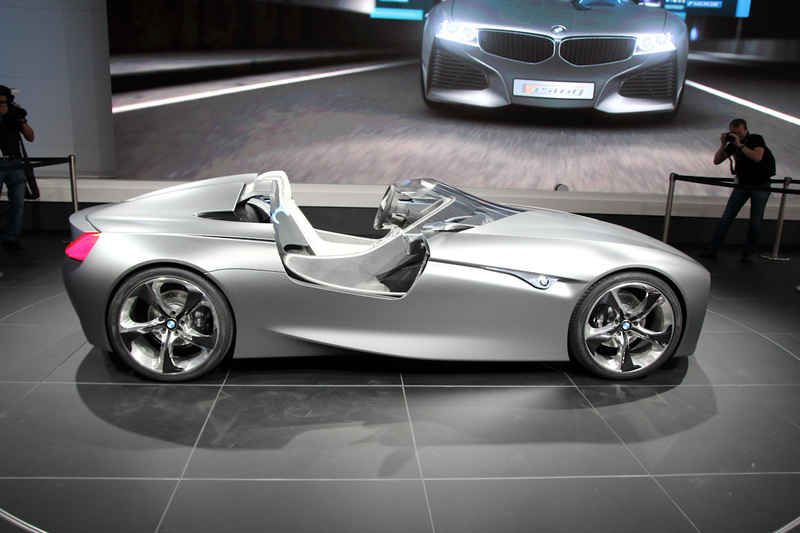 As a two-seater roadster charged with emotion, the BMW Vision ConnectedDrive is a particularly dynamic, purist interpretation of the characteristic BMW language of form: the long bonnet, the long wheelbase and the passenger compartment set well back seem to accelerate the vehicle even at a standstill. 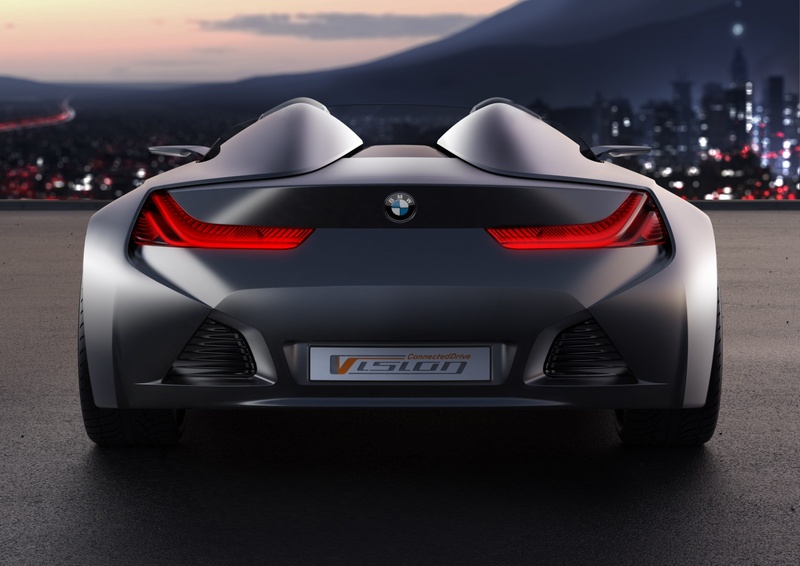 The bonnet and the windscreen flow into one another to form a homogenous surface and endow the BMW Vision ConnectedDrive with an extraordinarily flat, sporting silhouette. 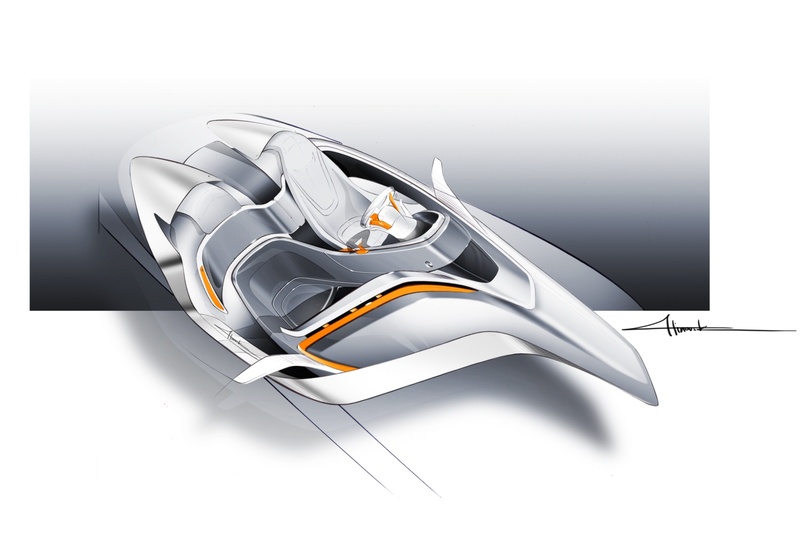 Within these tight roadster proportions, distinctive, concise lines flow over the taut surfaces of the vehicle’s bodywork. The resulting play of light and shadow imparts a fascinating and emotional character to this concept study. 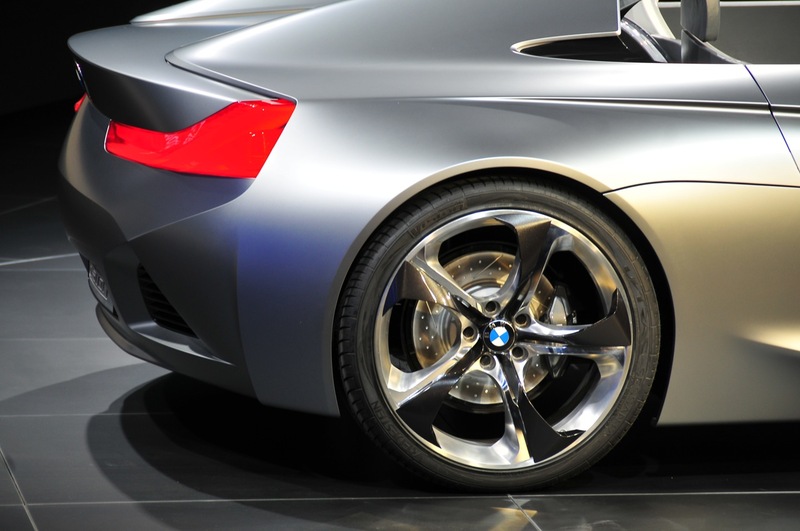 The expressive 20-inch wheels, fashioned in three dimensions, underscore the sporting, dynamic character of the vehicle. 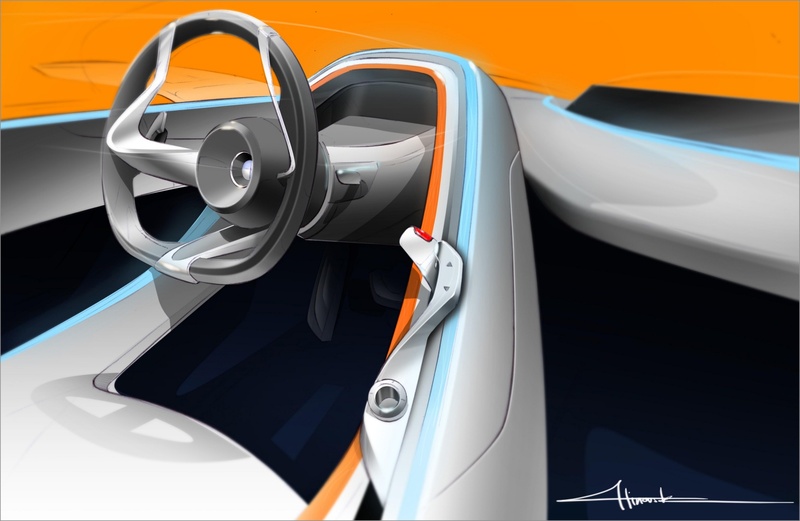 The door concept is a particularly distinctive feature of the exterior of the BMW Vision ConnectedDrive. 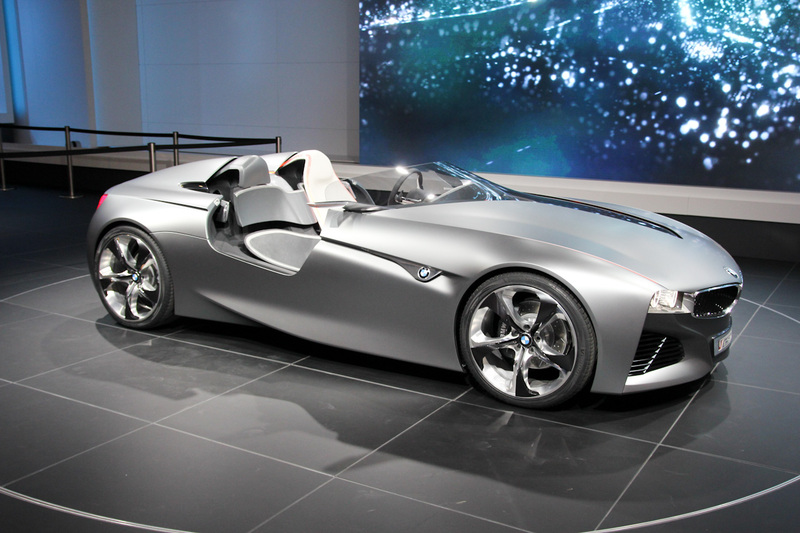 Developed with the innovative, electro- mechanical retracting door mechanism of the BMW Z1 in mind, which can be legally driven with its doors open, the idea has been extended and now finds application in the BMW Vision ConnectedDrive. Two sliding door elements – one inside, one outside – disappear into the bodywork of the vehicle when the door is opened, enabling entry. 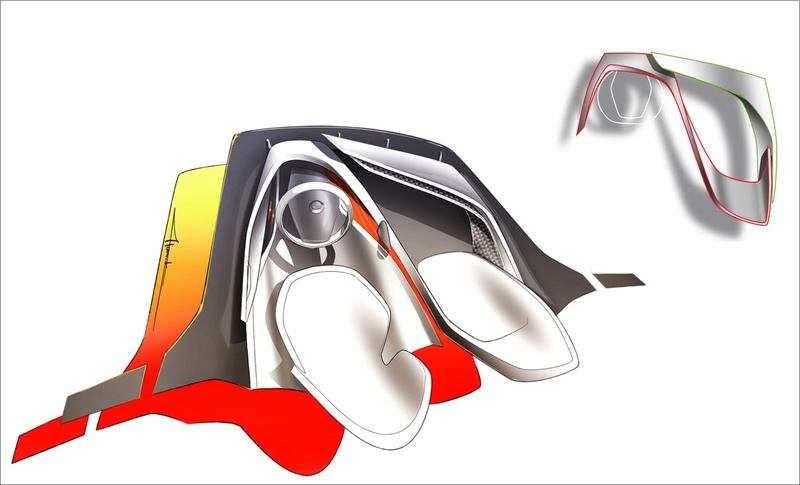 While the outer shell slides forward, the inner shell disappears into the rear area of the vehicle with a movement in the opposite direction. 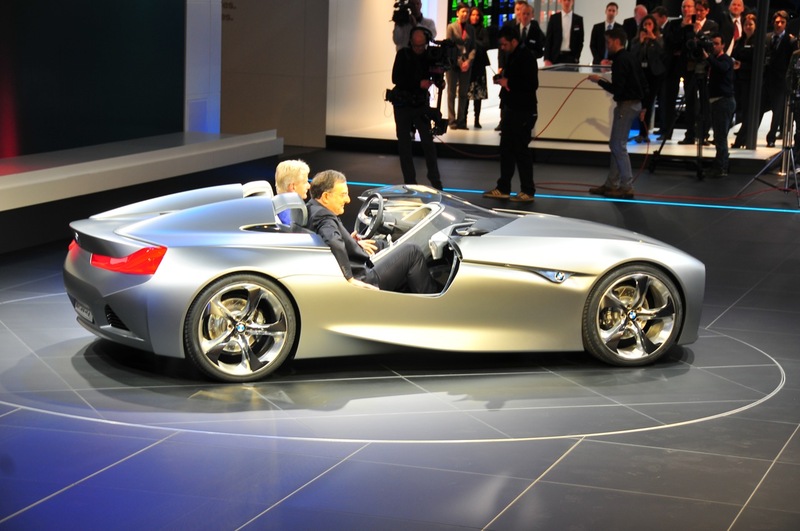 The BMW Vision ConnectedDrive can also be driven with the outer doors open, a central aspect of the vehicle. 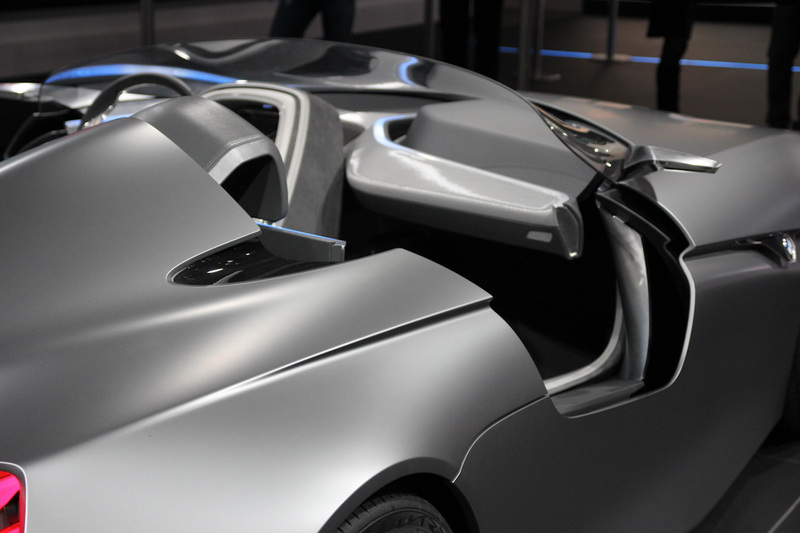 The expressive, modern surface work evident at the front and on the sides of the vehicle is continued at the rear. 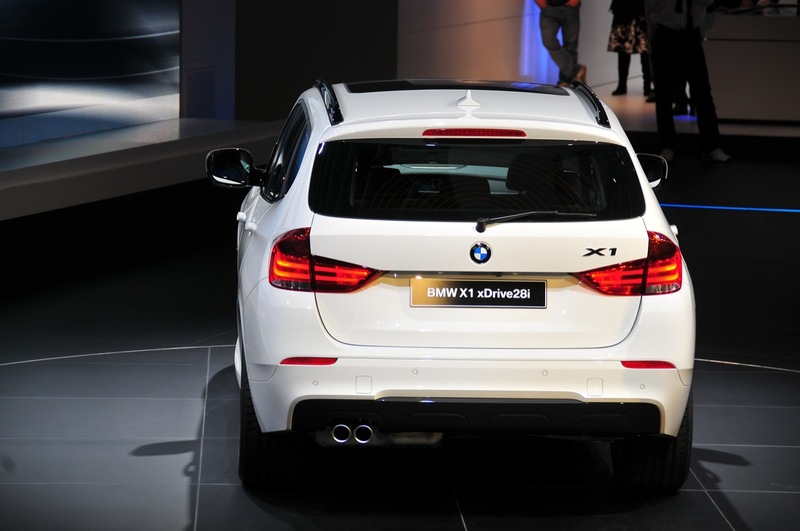 Two large air outlets make the formal connection to the front and underline the sportiness of the vehicle at the rear. 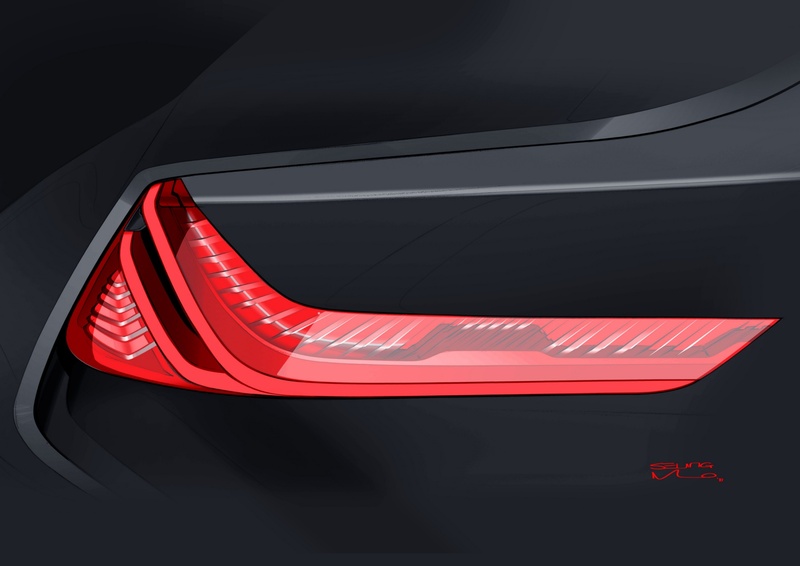 The rear lights, placed at the extreme outside of the back of the vehicle, feature the distinct BMW L-design and have a strong sculptural character. 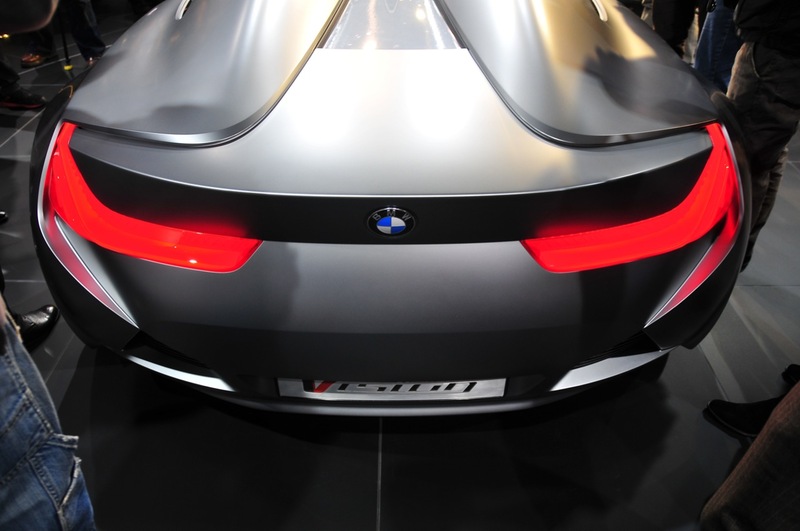 Just as at the front of the vehicle, the rear sensor technology is also integrated into the lights. The concept of layering used in the interior, in which a component takes on a number of tasks, is thus carried over to the exterior. 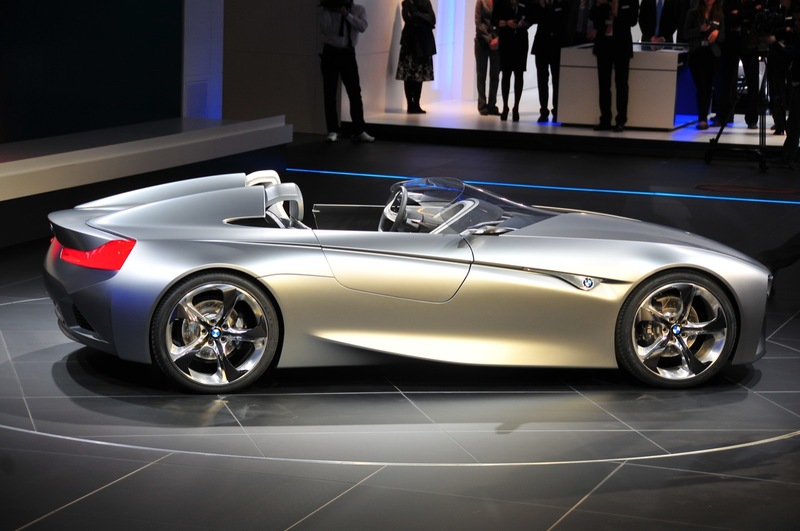 The BMW Vision ConnectedDrive concept car was consciously designed as a roadster, as the vehicle is able to show its overall creative concept best by way of the open roadster design. 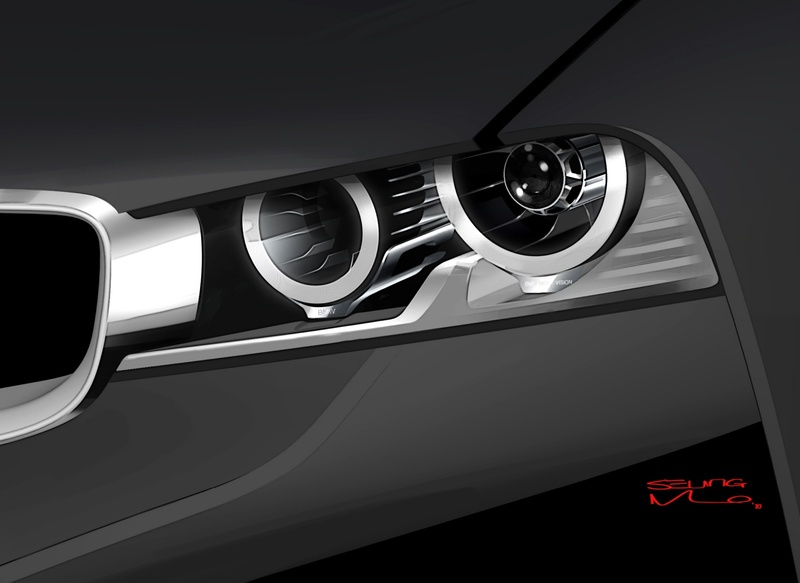 Seen from above, the interior design, light concept and exterior design fuse into a very clear, unmistakable statement: BMW ConnectedDrive. 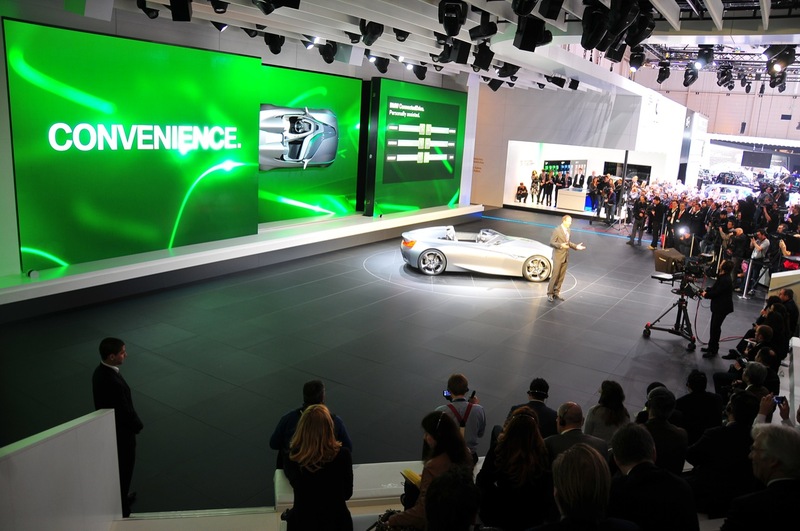 Changing perspectives – the Motor Show presentation. 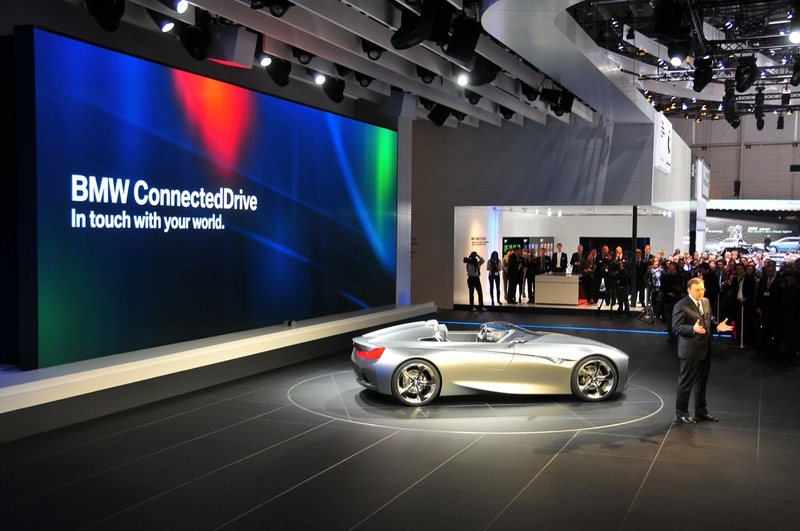 The future of BMW ConnectedDrive in three scenarios. 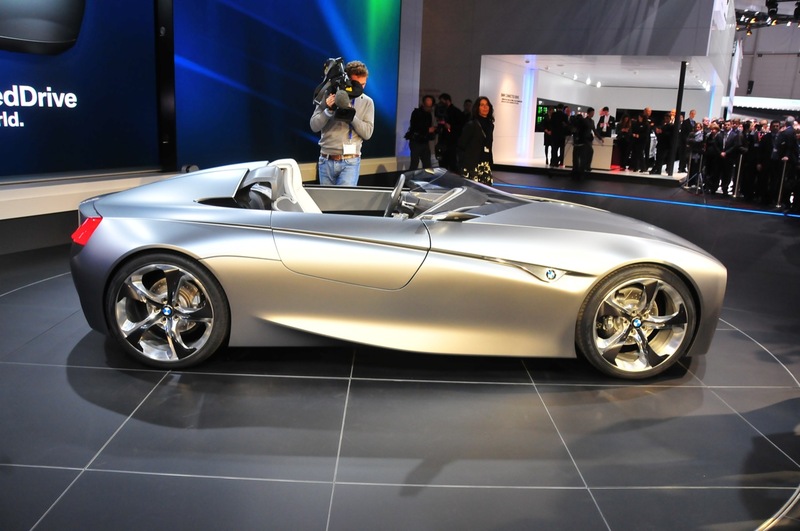 The BMW Vision ConnectedDrive integrates a multitude of features and approaches, all with great future potential. All these functions are based upon concrete research and pre-development projects. 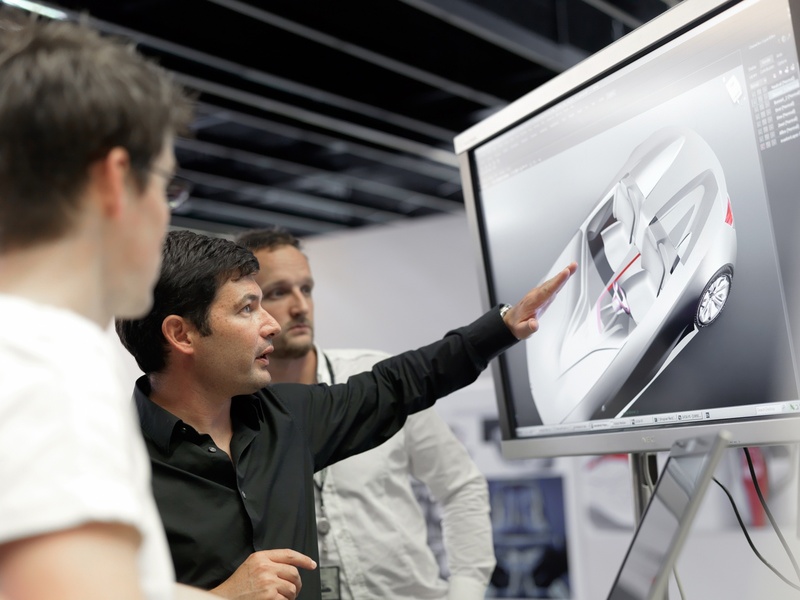 The engineers of the BMW Group are already working today on turning the functionality on show into reality. 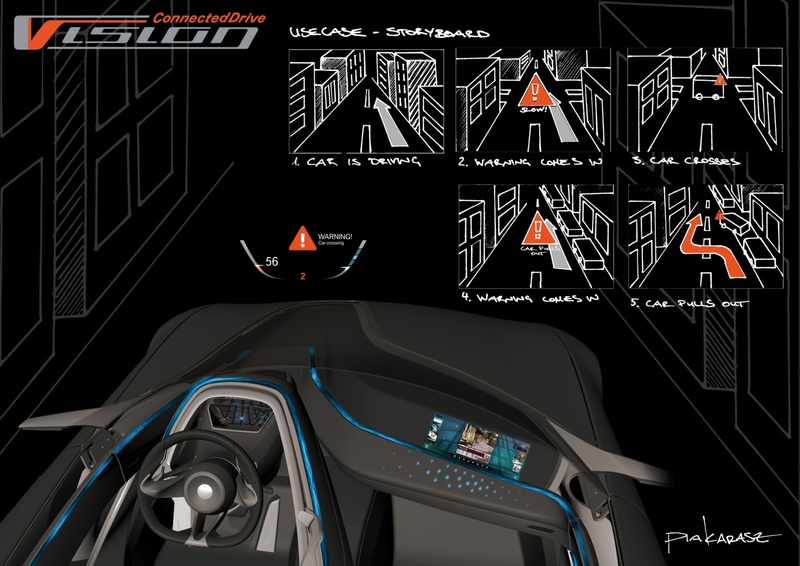 In three different scenarios, the BMW Vision ConnectedDrive illustrates the way the individual levels work and shows what BMW ConnectedDrive will be delivering in the future. So jump in! 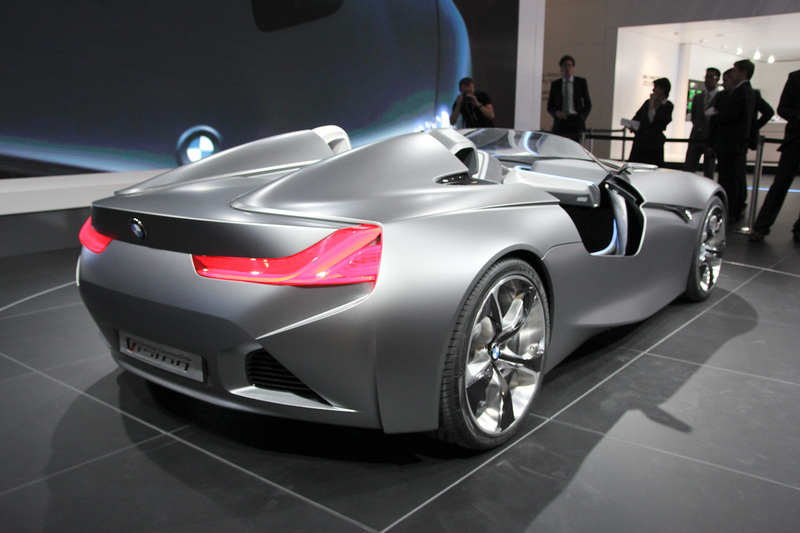 The features and technologies in the individual levels of the BMW Vision ConnectedDrive are best explained during a short drive. 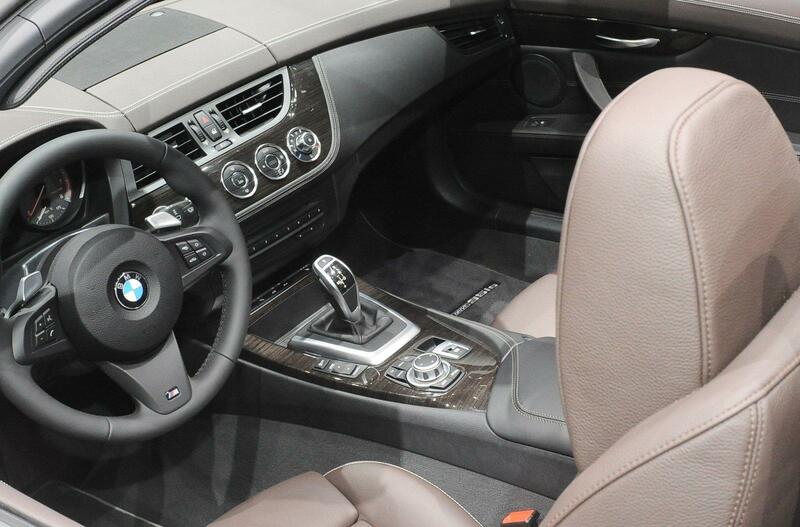 Comfort – the vehicle is your own personal concierge. 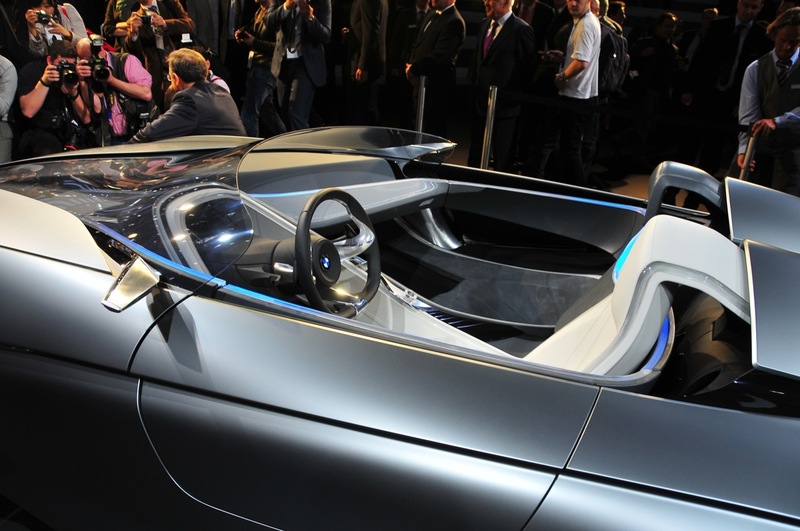 In the first BMW Vision ConnectedDrive scenario, you are alone in the automobile. After you get in, your smartphone automatically connects to the vehicle, the vehicle-specific apps are activated and can be accessed from the main vehicle menu on the freely programmable instrument cluster. The vehicle then immediately synchronises with your calendar and learns that you have a lunch appointment with a colleague in town very shortly. It passes the address of the restaurant to the navigation system and searches for a suitable route in order to arrive at the appointment on time. Up-to-the-minute traffic information is a component of the route calculation, as well as preset preferences, which for instance might get you there particularly quickly or particularly efficiently. In addition, parking options are considered as well as alternative methods of getting there by public transport. On the way to the restaurant, you receive a text message from your colleague. The Head-Up Display makes you aware of the arrival of new text message, you can read the message itself on the instrument cluster, or simply have it read out loud to you via the text-to-speech feature. Your colleague writes that he is already at your agreed meeting point but that the restaurant is much too crowded. He asks you to suggest an alternative. 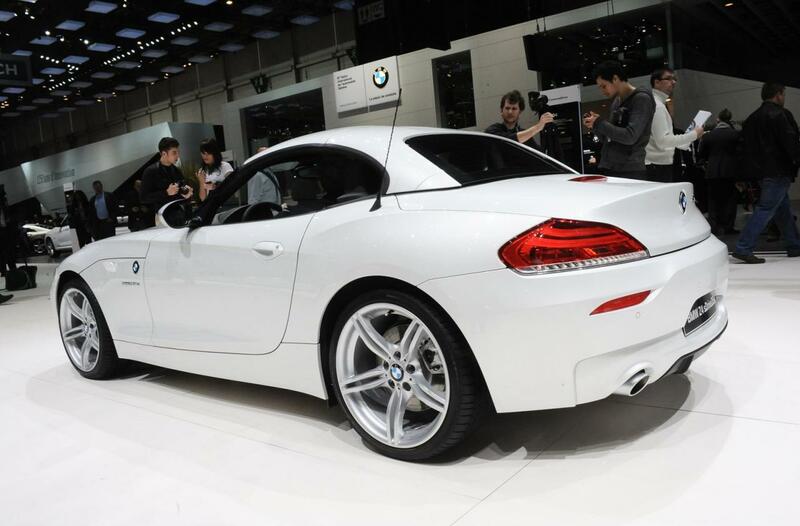 You then activate the BMW Assist Information Service. Your personal operator in the BMW ConnectedDrive Call Centre looks for an equivalent option nearby and, once you have agreed to his or her suggestion, he or she makes a reservation for you. This Concierge Service also transmits the new address information to your navigation system, you confirm the new destination in your navigation system and the guidance system swings into action. Afterwards, you activate the vehicle’s text message feature and using speech-to-text, dictate a message to your colleague with the address of the new restaurant. The alternative restaurant is located on the 25th floor of a high-rise building that has its own parking garage. When you arrive, the vehicle indicates the nearest free parking spot and directs you to it using augmented reality on the Head-Up Display. Before you leave the car and your smart phone disconnects, the vehicle transmits a MicroMap to your mobile, detailing the last few meters through the building to the restaurant. Your mobile then takes over the guidance function. After you have got out of the car, the automobile drives itself automatically into the parking spot. Networking ensures the highest degree of navigational comfort. The scenario shown here illustrates mainly future uses of networked navigation, comfortable parking functions and maximum integration of consumer electronics devices (CE devices). Already today, with mobility services such as the car park search, a BMW driver will not only be guided to a parking garage or a parking spot but the BMW Parkinfo function will even automatically show the driver all the currently available parking spots in that parking garage. Over 820 parking garages throughout Germany already provide this data dynamically. The “Remote Controlled Parking” research project has already demonstrated in prototype that the capability of vehicles to park themselves is a reality. 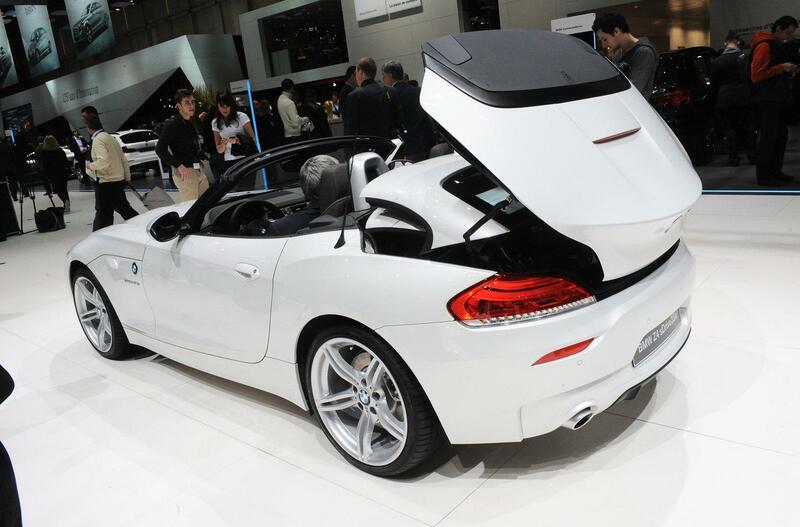 Once all passengers have left the car, the car rives into the garage on its own. This manoeuvre is activated using the car key. 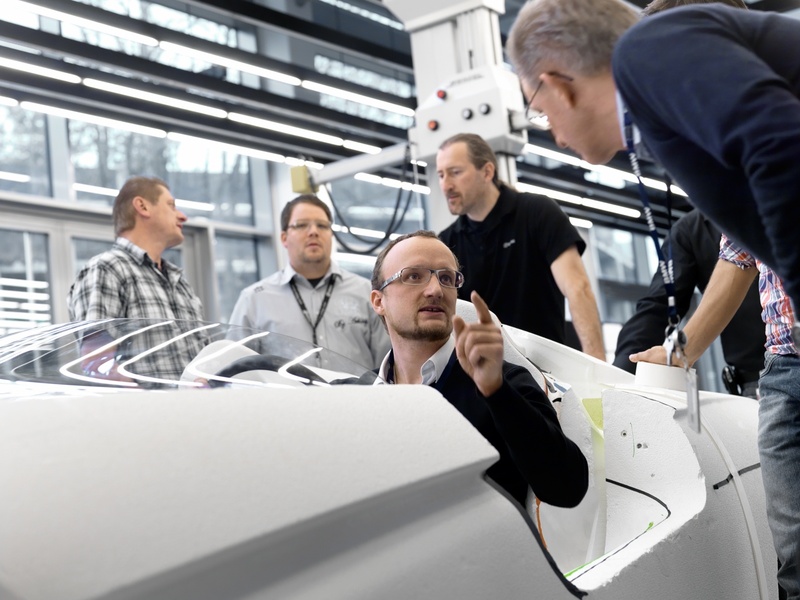 This is just one example of how assistance systems networked with their environment can in the future deliver automated driving features of great value to customers. Since 2006, BMW drivers using “Send to Phone” have been able to load this last stage of the journey to a mobile device to ensure that no time is lost when walking the last few meters to the ultimate destination. 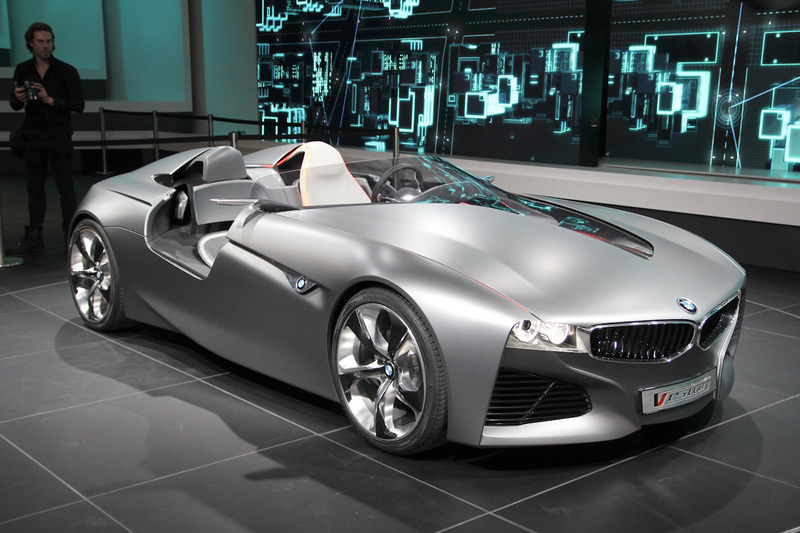 Navigation by means of vehicle and CE device within large areas that do not appear on current navigation maps and even within buildings, is under development by specialists of the BMW Group as part of the “microNavigation” research project. MINI Connected and BMW Connected are an excellent illustration of how tightly the world of smartphones can already be integrated into vehicle architecture. Amongst other things, Webradio, Facebook and Twitter can be made accessible in the automobile via a vehicle-specific app. In the future, many enhancements will take place in this area, due to the application-based character of the system. These will be integrated simply by updating the application. The recognition of CE devices is not the only area where great strides forward are being made. Today, the vehicle can read out loud using text-to-speech; as a part of the “MessageDictation” research project, BMW engineers are currently working on the recognition of free text so that the driver will be able to “write” a text message or e-mail simply by speaking, without taking his hands off the wheel. The world of Infotainment in the vehicle. 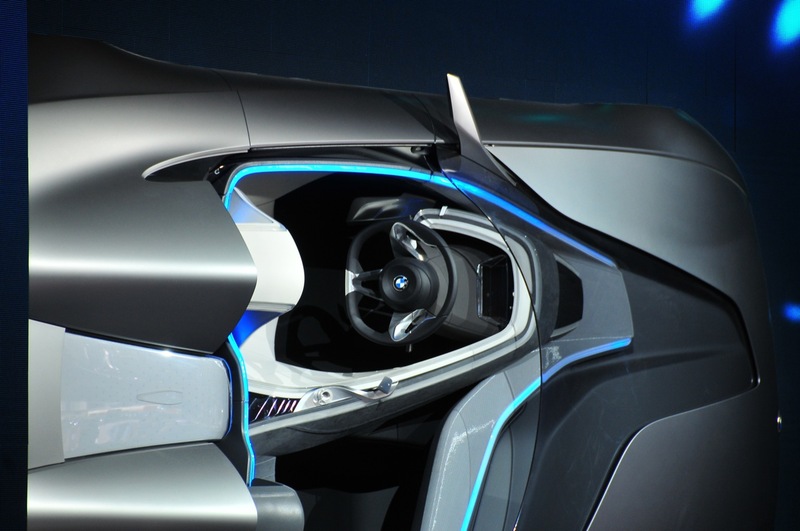 In the second BMW Vision ConnectedDrive scenario, you experience what BMW ConnectedDrive will be delivering in terms of Infotainment in the future. At the beginning of this scenario, you are the passenger. While driving through a city where you have never been before, you activate the Emotional Browser via the touch sensitive area on the instrument panel. The Passenger Information Display in the instrument panel comes to life. You immediately receive information, formatted very much like magazine articles, on points of interest such as cafés, museums or sights of interest in the vicinity. The Emotional Browser gives you the ability to easily filter the information to meet your requirements, to organise it and change the layout of the display. You are driving past a café renowned for its good music. The Emotional Browser shows that a playlist of selected titles played in the café is available as an audio stream. You view the titles and decide that you would like to listen to the music. You send the playlist to the driver with a wave of your hand. It is displayed on the instrument cluster while you are waiting at the next red light. The driver also likes the playlist and confirms that he also would like to listen to the music by using the multifunctional steering wheel or the iDrive Controller. Streaming commences and the music plays. Simultaneously, the cover of the playlist appears in the menu bar under Entertainment/Multimedia and is displayed while the music is playing. With good music playing in the background, you decide to find out a little more about the buildings around you and activate the “architecture” filter. The Browser now exclusively shows you relevant information on the architectural highlights, both near and far. While you are being provided with detailed information on your display, the Head-Up Display discreetly points out features of architectural interest on the buildings that you are passing to the driver. One building interests you in particular so you retrieve detailed information about it. It is a museum that is currently hosting an exhibition that appeals to you. A gesture is all it takes to pass more detailed information on the exhibition to the driver’s instrument cluster and to suggest that the museum become the new destination. The driver can either briefly take a closer look or accept the address straightaway as the new destination for the navigation system. Once the new destination has been confirmed, the vehicle informs the driver of the distance to the building, journey duration and makes suggestions on alternative routing. You purchase tickets to the exhibition online during the journey. As soon as the destination comes into view, the driver is provided with a highlighted augmented reality view of it, helping you to quickly complete the last stage of your journey. Location-based information and intelligent filter functionality. 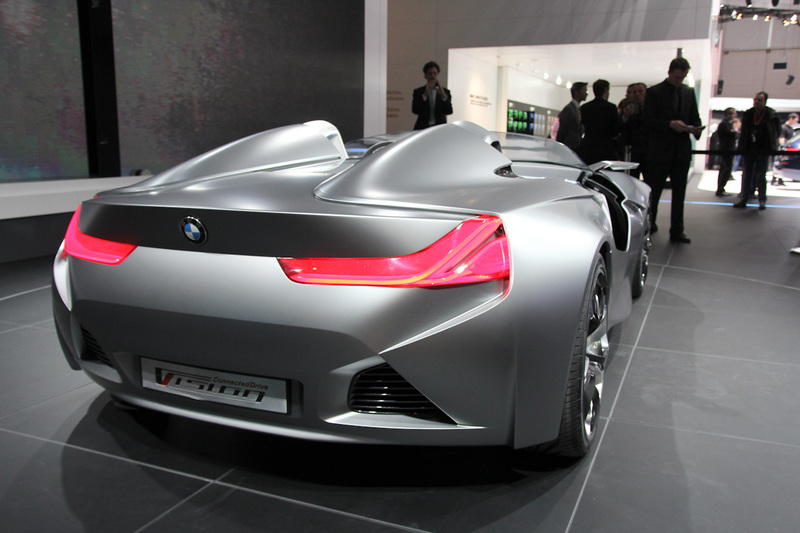 The BMW Vision ConnectedDrive Infotainment scene is based primarily on location-based information. Only information on the surroundings falling within a certain, predefined radius is shown. The filter features allow the information available to be filtered by content and to be displayed as a specific selection and even personalised. These filter settings can be made in the comfort of your own home or can be carried out spontaneously in the vehicle. Individually tailored information is thus obtained from raw data. The filters work semantically, ordering information not just by keyword but also by the meanings associated with that keyword. In addition to the “architecture” filter, filters such as “leisure activities” or “events” display cinema schedules, concerts and exhibitions next to one another – according to preferences that have been set up or learned. The predefined filters are not static. They can be adapted to suit individual preferences or can be set up from scratch. Location-based services enable the information available to be used to create a digital tour of the city or to book a ticket, complete with the appropriate entry in the digital calendar. 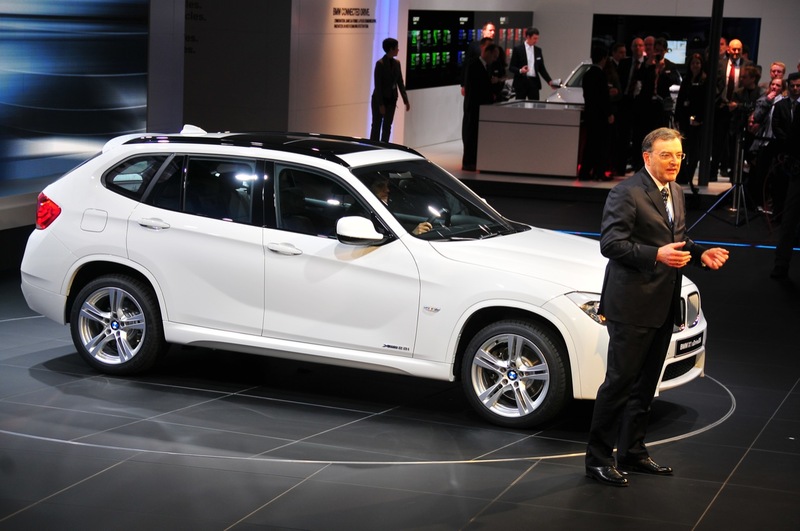 Location-based services in all BMW vehicles – available right now. 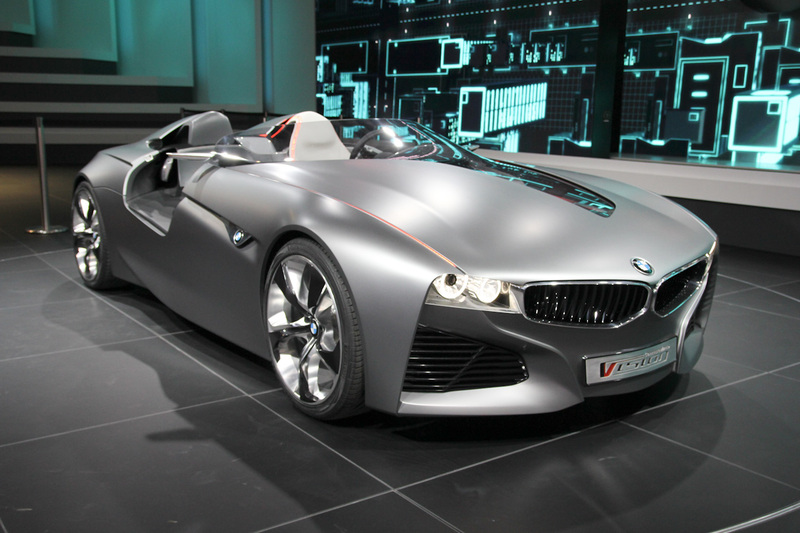 As early as the beginning of 2002, BMW ConnectedDrive started to make use of location-based services possible via the Information Service, either from the customer’s home or by using the Internet access point in the vehicle. In 2007 this was supplemented by Google Local Search and in 2010 was expanded yet again to include pictures of the destination supplied by Google Panoramio and Street View. Addresses found can be passed directly to the guidance system of the integrated navigation equipment. 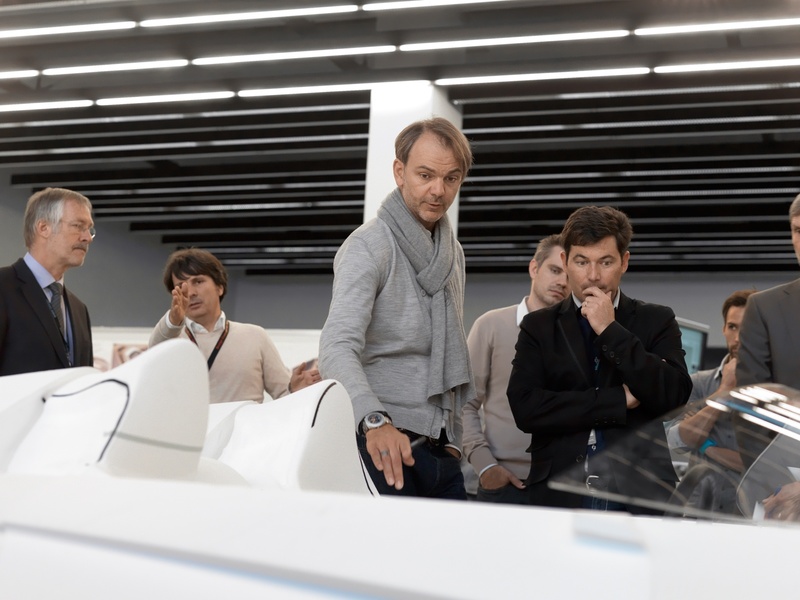 In addition, the BMW ConnectedDrive Information Service is always available by telephone with the right answer to your question – with opening times or entrance prices for example. All types of questions – the location of a duty chemist, flight information, the nearest DIY centre or the address of a friend – are answered personally in a telephone conversation. If you so desire, the Information Service will transmit the address and contact details of your destination directly to the vehicle’s navigation system. 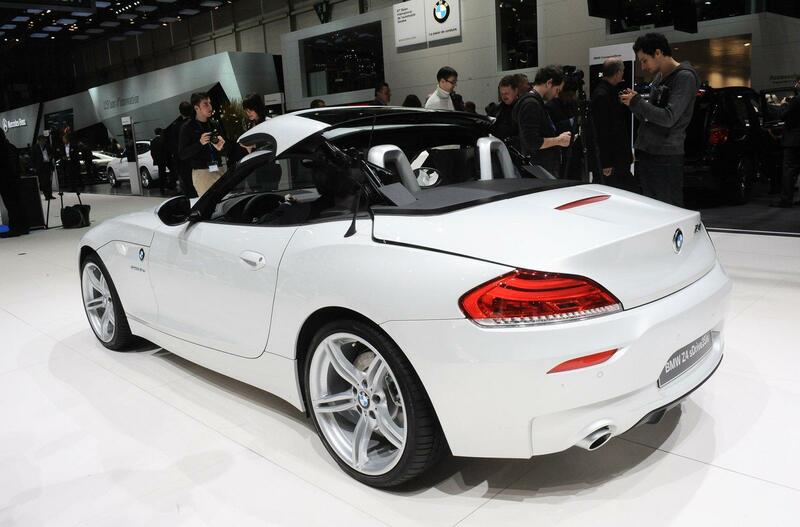 The address is then confirmed at the touch of a button on the BMW iDrive Controller. In order to make the filter features even more intuitive in the future, the BMW Group is conducting research into semantic information processing. The Mood Based Playlist is a good example. This feature gives the driver quick and intuitive access to music that might appeal to him at that moment. The selection of music is not limited to his private collection at home or to the MP3 player but is drawn from the unlimited content of the Cloud. Based upon the mood selected, the Mood-Based Playlist puts together a pre-selection of music for the driver, which he can then reduce even further with additional parameters such as genre or period. The driver is treated to a personal selection of music, tailored to his own taste, drawn from millions of songs – quickly, simply, without complicated searching and available anywhere. In the last scenario we find ourselves back in town. Together with your passenger, you are driving along busy streets. The navigation system is activated. Via the three-dimensional Head-Up Display, you have all the information relevant to the journey such as speed, fuel consumption and navigational details directly in your field of view. Thanks to the augmented reality feature, the navigational details appear to be on the street itself and show you the way forward. In addition, the freely programmable instrument cluster displays a two-dimensional map of your surroundings, with your route highlighted upon it. Your passenger is watching a film on the Passenger Information Display in front of him. All the while, the sensory system constantly scans the space around the vehicle and along the chosen route. Caution! Several sets of traffic lights on your route have just failed. The vehicle immediately projects a warning directly into your field of view on the Head-Up Display. Simultaneously, the instrument cluster provides you with a map of the affected area, showing in detail precisely which traffic lights along your route are out of operation. The warning also stops the film playing on the passenger’s display so that nothing will distract you from the hazard ahead. 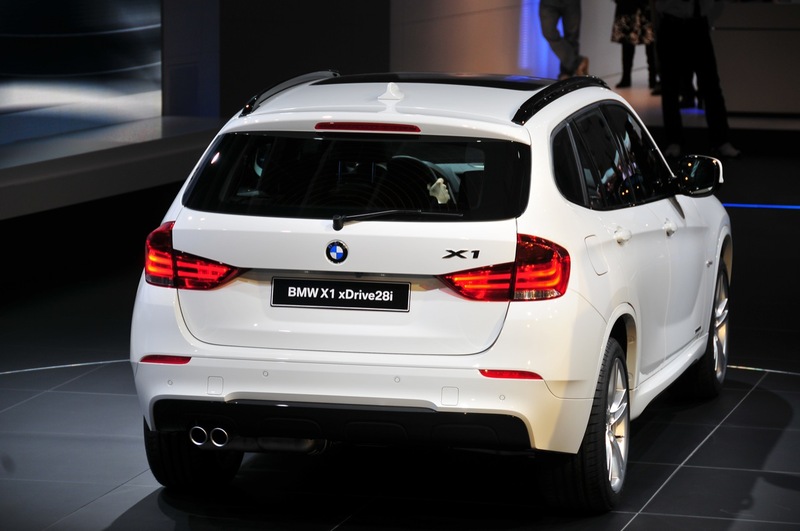 In all the situations in which BMW ConnectedDrive issues a warning, the fundamental principle is that warnings have priority over any other information. his gives you the best possible opportunity to grasp the situation, evaluate it and react appropriately. After the initial urgent warning, the warning icon moves off to the side, reminding you to pay greater attention than usual while continuing your journey. The film resumes where it stopped. Making the invisible visible – sensors that can see around corners. Just before the road junction with the first set of failed traffic lights, a new warning appears: danger of collision! Even before the road junction comes into view, your vehicle has exchanged information with other road users on the route ahead and has recognised a potentially dangerous situation. A car is approaching the road junction from the left at full speed even though it does not have right of way. If both vehicles maintain their present courses and speeds, a collision is likely. Your vehicle immediately makes you aware of the probable collision on the Head-Up Display and highlights the approaching car on a map on the instrument cluster. Again, the film on the passenger’s display is stopped. As soon as the other car comes into view, it will be highlighted by an augmented reality outline. This gives you the opportunity to brake in time, let the other vehicle pass and to avoid a possible accident. Further along the route, suddenly a vehicle unexpectedly emerges from a parking spot on your right. The sensory system immediately registers this and shows the emerging vehicle as a hazard in the Head-Up Display. The brakes are automatically applied, reducing your speed, and the minor jolt prompts you to deal with the situation yourself and to either continue braking or to take evasive action. Since the peripheral scan has shown that avoiding action will not be dangerous, the vehicle simultaneously makes an avoidance suggestion on both displays in the form of an arrow positioned over the lanes in the road. Displaying the options available in augmented reality allows the driver to quickly grasp the situation so that he can react intuitively, promptly and appropriately. Car2Car communication and automated actions. 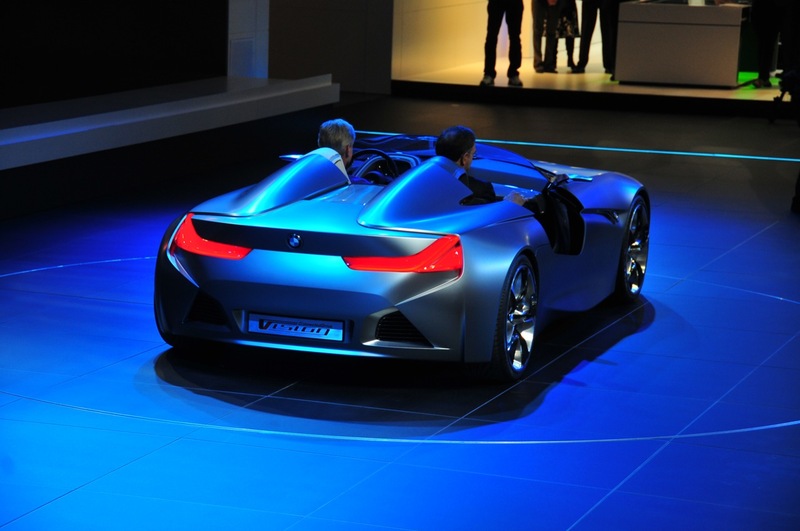 During this short sequence of events, the safety features of the BMW Vision ConnectedDrive warned you of three critical situations and helped you avoid two very probable accidents. This scenario elegantly demonstrates the potential of vehicle-to-vehicle communication, advanced object recognition and partially automated safety features. 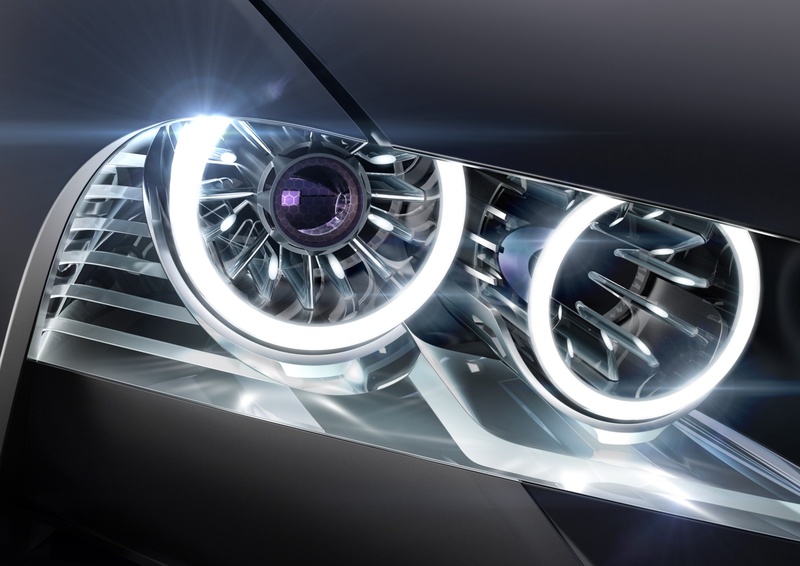 The BMW Group has been conducting intensive research in these fields for many years and has developed key functionality such as the BMW Night Vision Pedestrian Recognition System to a level where it can be put into series production. The direct exchange of information with other road users via vehicle-to-vehicle communication (Car2Car) allows the car to “look into the future” and to “see around corners”. It can thus determine where other vehicles or people are and how they relate to your own vehicle’s route and it can recognise critical situations at an early stage. The combination of partially automated safety features with a sophisticated environment recognition system acting via sensors and with the consolidation of sensor data puts you in a position to carry out a controlled emergency manoeuvre should a critical situation arise – either emergency braking or avoidance, depending upon the situation. 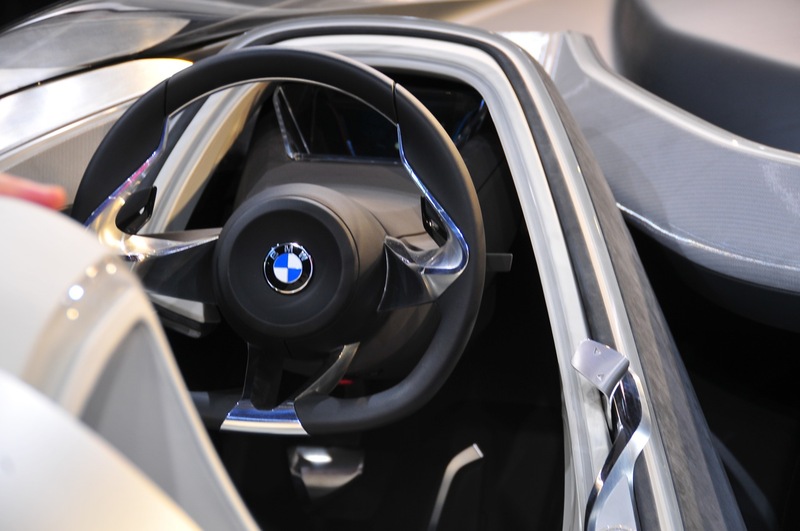 The fundamental principle of BMW ConnectedDrive safety features, both today and in the future is as follows: as long as the driver is able to take action, his actions will always take precedence over any active intervention on the part of the vehicle. Only if the driver does not react appropriately or is unable to react at all, will the vehicle provide support in the form of automated intervention, as a last resort. 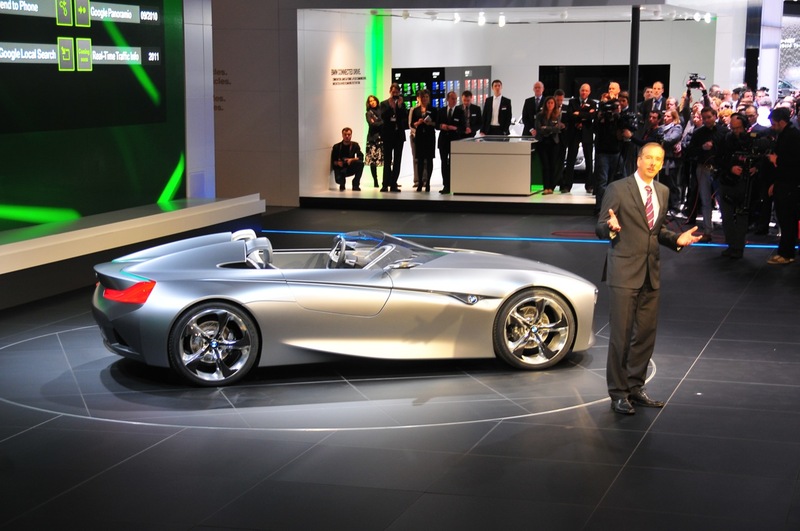 Status of current research at the BMW Group. 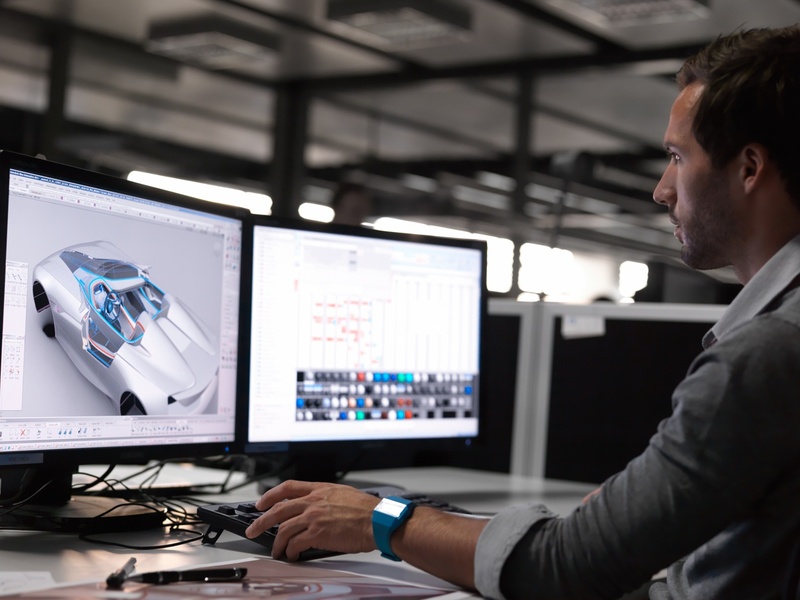 In a multitude of research projects BMW Group engineers are already working on making the illustrated scenarios a reality. In the AMULETT and Road Junction Assistant projects, cooperative sensory systems and vehicle-to-vehicle communication over WLAN allow prototypes to “see around corners” even today and to recognise unseen pedestrians or vehicles at an early stage. If there is the risk of a collision, the vehicle warns the driver so that he can brake or take evasive action. If there is no time left for braking, in both projects the vehicle will slow down of its own accord. The active emergency braking system is a research project in which the vehicle itself is able to recognise the danger of critical rear-end collisions. It warns of a collision in a multistage scenario and, if necessary, will decelerate the vehicle to a halt in order to avoid an accident, even from high speeds. 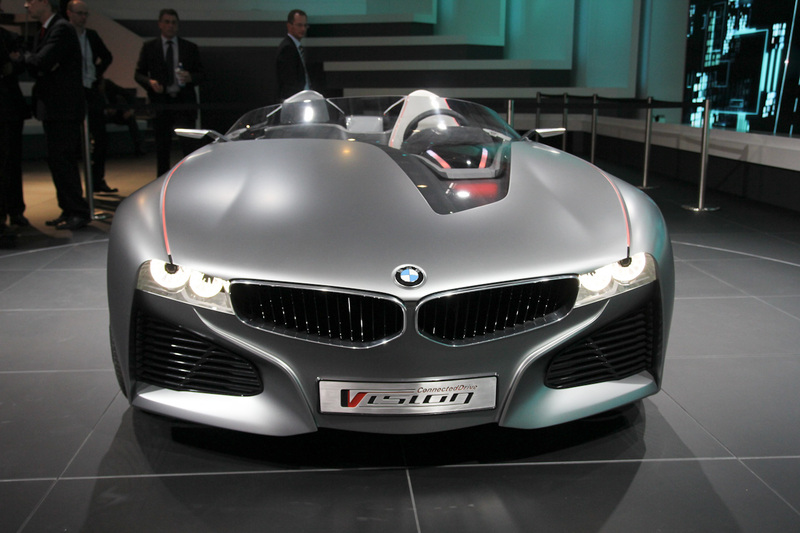 The BMW Group development engineers are also working on securing the area alongside the vehicle. In a prototype built by members of the Lateral Collision Avoidance project, a driver assistance system prevents vehicles coming too close to one another laterally and also prevents collisions. If a vehicle comes closer than a certain critical distance, the display switches from providing information to issuing a warning, supplemented by a light steering movement, which can be overridden at any time. If the driver follows this haptically-implied course of action, the imminent collision will be avoided. In order to automatically carry out avoidance manoeuvres, an extremely large area around the vehicle needs to be reliably monitored in order to take into account oncoming and turning traffic. Apart from this, the vehicle needs to be able to steer itself. This ability is demonstrated by the prototype built for the “Traffic Congestion and Tailback Assistant” advance development project. The intelligent cruise control and distance maintenance feature now deals not only with linear acceleration but can also steer automatically to a limited extent, thus keeping the vehicle from coming off its lane. Since today the space around the vehicle that can be monitored is limited – especially at high speeds – this project is aimed primarily at raising the level of comfort and convenience, rather than achieving fully automated driving. The “Emergency Stop Assistant” research project demonstrates uses of these technologies in the service of safety. In an emergency on the motorway, the vehicle steers the incapacitated driver automatically across several lanes of traffic to the hard shoulder and safely comes to a stop. At the same time, it makes a fully detailed emergency telephone call. 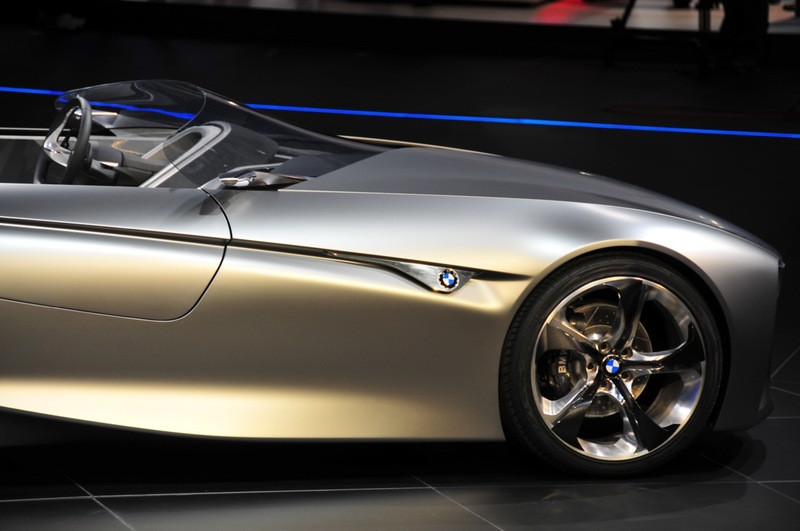 In the case of BMW Vision ConnectedDrive, the future is already here. It is reality today. 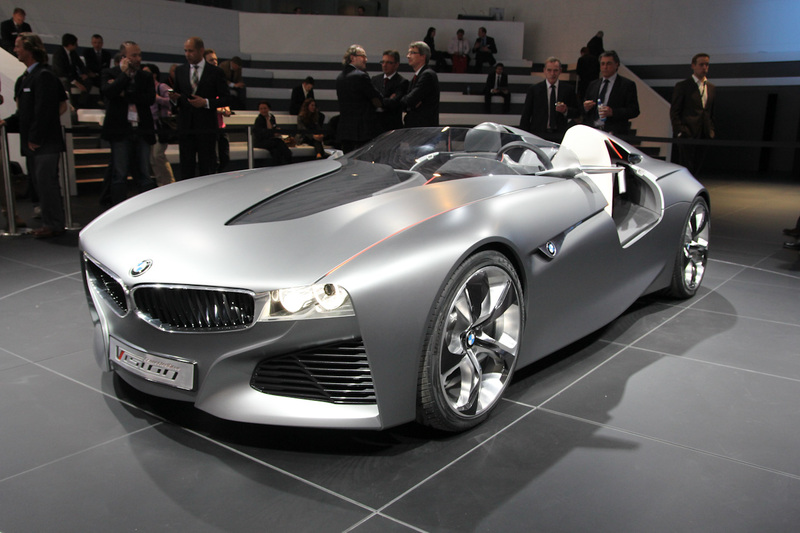 The engineers of the BMW Group are working incessantly to turn this into reality for series production vehicles, too. However, customers can already benefit today from the sophisticated driver assistance systems in the vehicles of the BMW Group. The camera integrated into the BMW Night Vision system is able to detect not just people and animals at twilight and at night but it also analyses the pictures it captures, recognises people, calculates possible collision corridors and warns the driver of dangers which are barely perceptible with the naked eye or which cannot be seen at all. 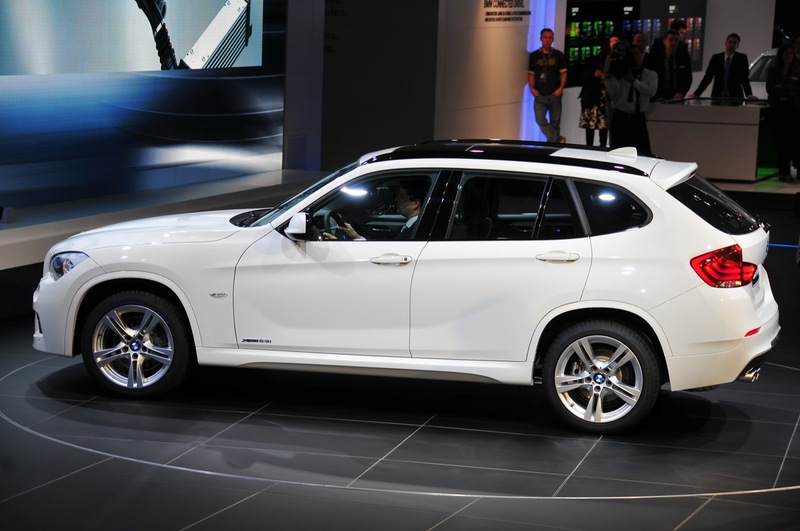 Safety is also considerably enhanced in the current range of BMW vehicles by the Active Cruise Control with Rear-End Collision Warning and Braking feature or by the Advanced Emergency Call from BMW ConnectedDrive. Interface design – in touch with your world. 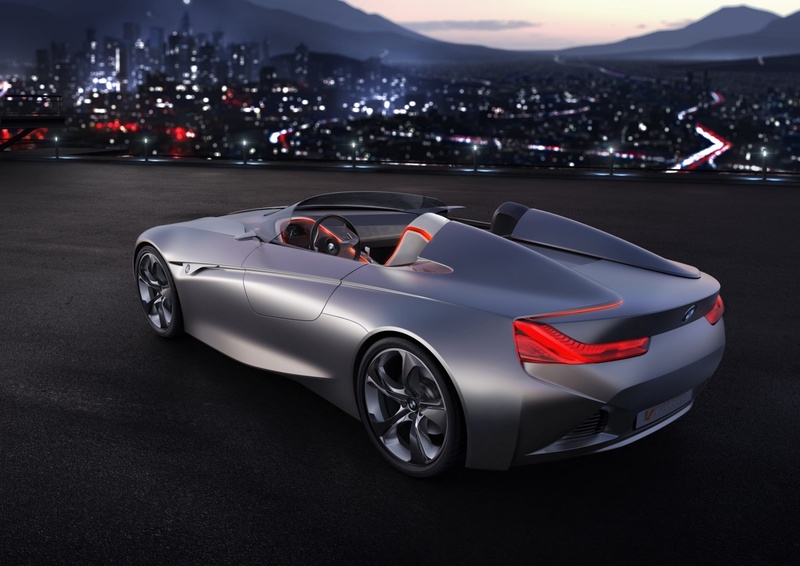 The new display and operating concept in the BMW Vision ConnectedDrive is both visionary and innovative. 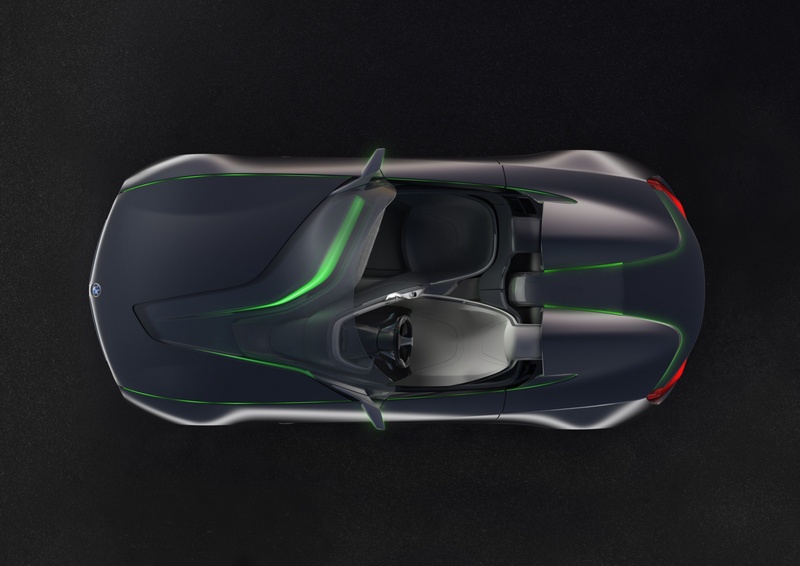 As the heart but also as the expression of the highly integrated networking of the vehicle, these interfaces are the points of contact via which driver and passenger interact with the vehicle on the one hand and with the environment and the world of data on the other. Three independent display instruments, fully networked with one another, process and prepare the incoming information and present relevant information in the driver’s and passenger’s fields of view. Perfectly matched, they expand awareness of the outside world and of the interior of the vehicle. 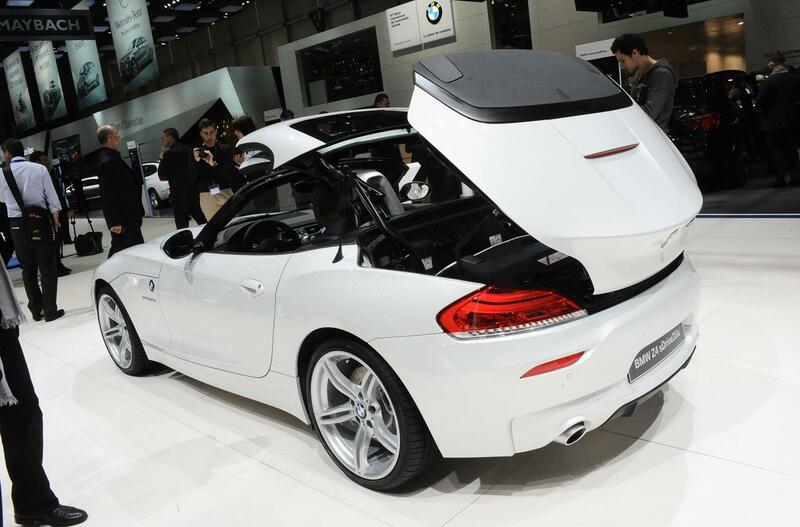 Ergonomic, needs-based access to information has always been one of BMW’s special areas of expertise. 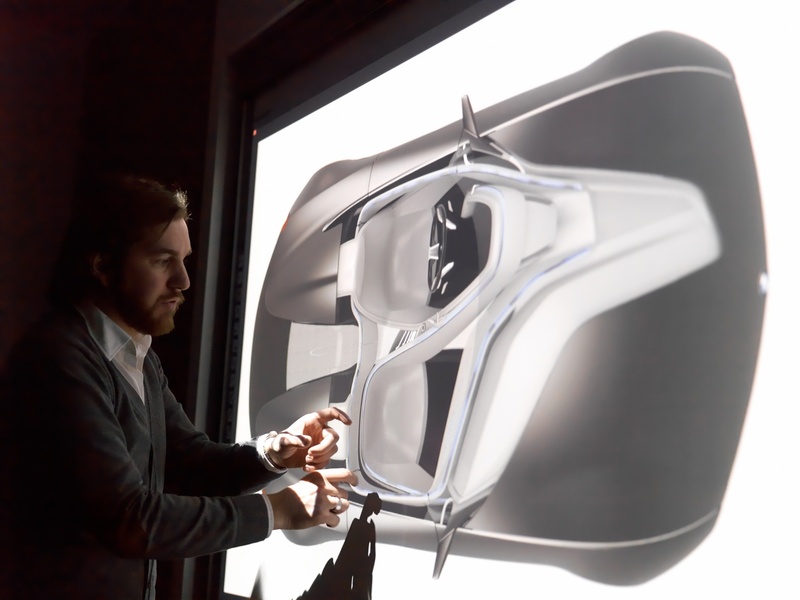 With the three-dimensional display in the BMW Vision ConnectedDrive, the BMW Group development engineers underscore this most impressively. 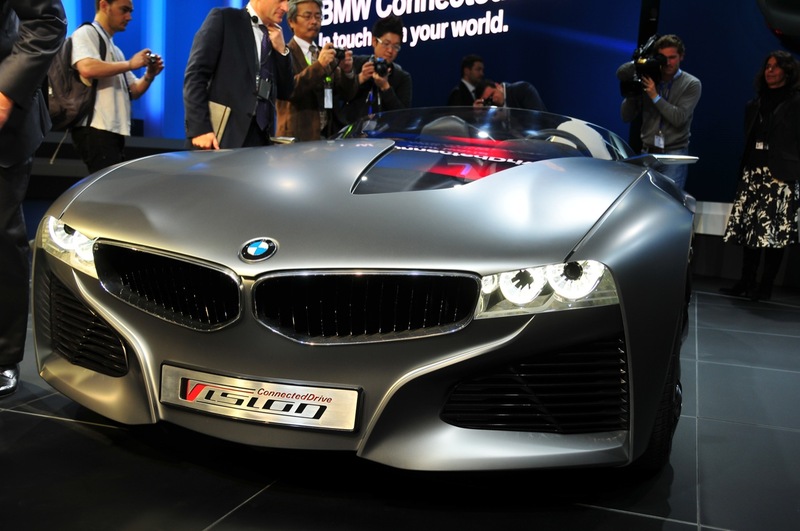 The three-dimensional Head-Up Display and the three-dimensional freely programmable instrument cluster, familiar from BMW Vision EfficientDynamics, hold the entire spectrum of information for the driver. With the Passenger Information Display, the passenger has – for the first time – his own independent display, which cannot be seen by the driver. The displays, along with their functionality and locations, have thus been carefully tailored to these two people and placed in their lines of sight. 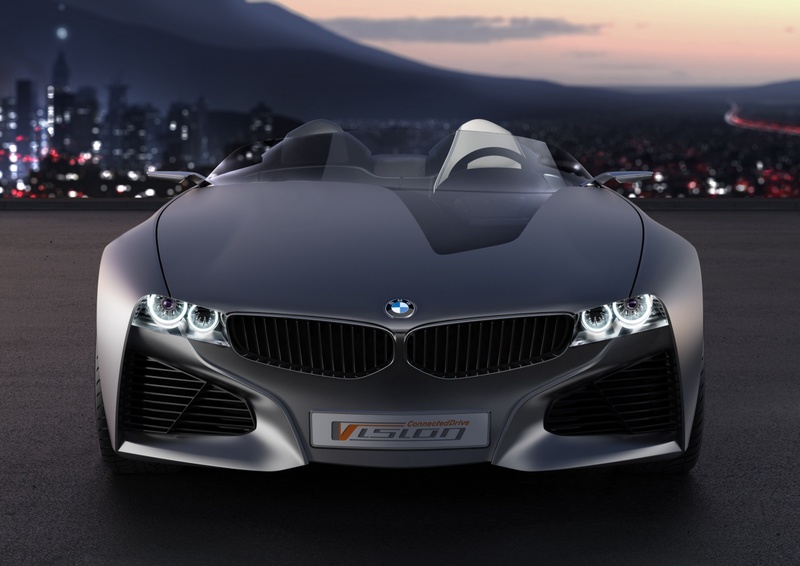 The three-dimensional Head-Up Display – ensuring that vital information is always in view. 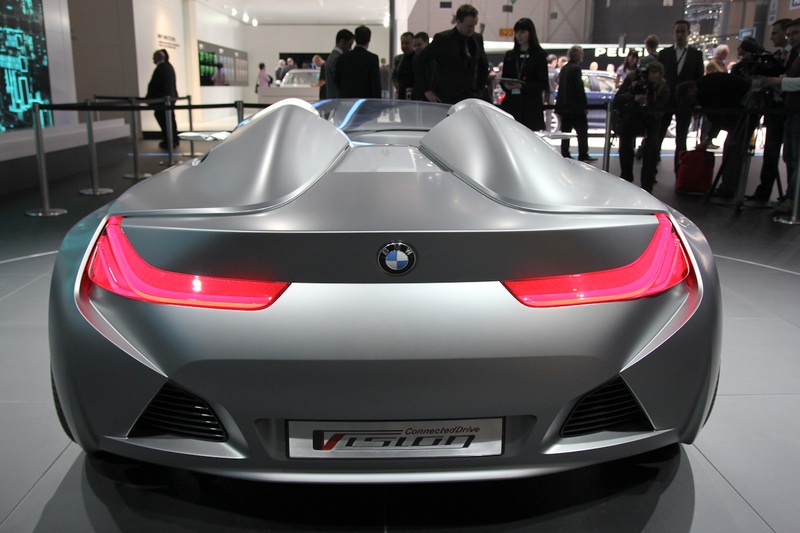 A large section of the windscreen, directly in front of the driver, acts as a Head-Up Display in the BMW Vision ConnectedDrive. 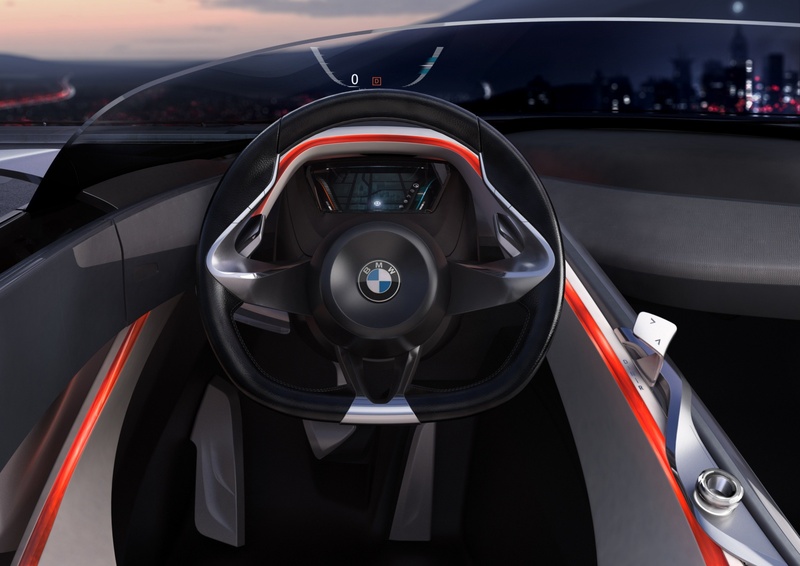 In the BMW Vision ConnectedDrive this area, enhanced by augmented reality functionality, is the main information display interface for the driver, taking over from a conventional instrument cluster. Information pertaining to the journey such as speed, navigational details or warnings is projected onto the windscreen. The information shown on the Head-Up Display appears directly in the driver’s field of view and looks as though it is hovering above the bonnet. The major benefit is that the driver’s eyes do not need to refocus to assimilate the information because it is presented exactly where his attention is – on the road ahead. Innovative display technology enables various pieces of content to be shown positioned three-dimensionally, one on top of the other. This superimposition allows different signals to be displayed either in the foreground or the background, depending upon the driving situation and – more importantly – upon their significance. For example, the speed of the vehicle will remain visible in the background while current information on routing or warnings are being displayed in the foreground. A further feature of the three-dimensional Head-Up Display is its ability to show the driving situation enhanced by augmented reality. The actual driving situation can be overlaid with virtual information, enriching it. The driver sees more. 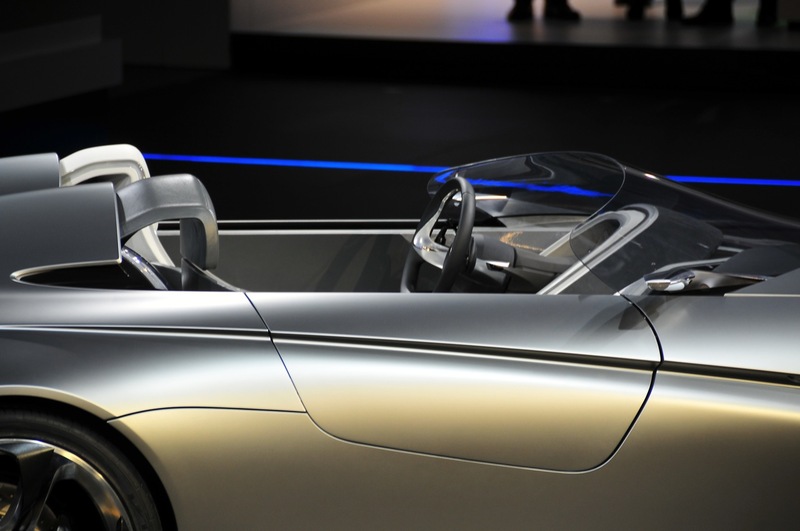 The Head-Up Display places the additional virtual information precisely over the actual driving situation. This, for instance, enables the superimposition of navigational information on the street itself or the highlighting of certain buildings or hazards such as vehicles or pedestrians. Thanks to the highlighting, the driver can assimilate important information much quicker and take appropriate action. More information – the freely programmable instrument cluster. The perfect piece of equipment to augment the three-dimensional Head-Up Display is the freely programmable instrument cluster, which also has three-dimensional capability. It acts as the central information display. As an expression of maximum driving orientation, it is positioned directly in the driver’s line of sight and takes the place of a conventional instrument cluster. The driver can thus see the information it displays much better, and it keeps the time during which he is obliged to avert his eyes to a minimum. The instrument cluster supplements the projected information in the Head-Up Display with further information: for example, a map showing the current route, entertainment information such as covers or title lists but also short texts like text messages or e-mails. 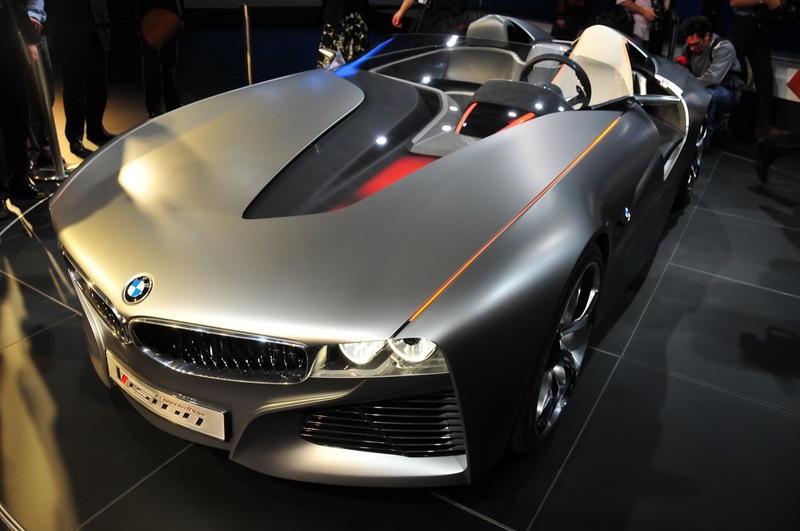 It is therefore far superior to a conventional instrument cluster. Just as with the Head-Up Display, several layers allow content to be displayed in three dimensions and superimposition enables the prioritisation of the individual pieces of information. Since the display interface is freely programmable, the BMW Group developers have succeeded in presenting the information in the instrument cluster in an optimal manner, displaying and prioritising it in accordance with its warning or informational character. Passenger information display – personalised passenger entertainment. Since the conventional central display has migrated to the instrument cluster, the passenger has now been provided with his own interface in the form of the Passenger Information Display. Detached from the driver’s two display instruments, the passenger has been given his own arena of interaction. Positioned so that the driver cannot see it in order to avoid distracting him, it enables the passenger to control his information and entertainment programme to suit his own requirements but also to access additional information which he can then transfer to the driver’s instrument cluster with the wave of his hand. 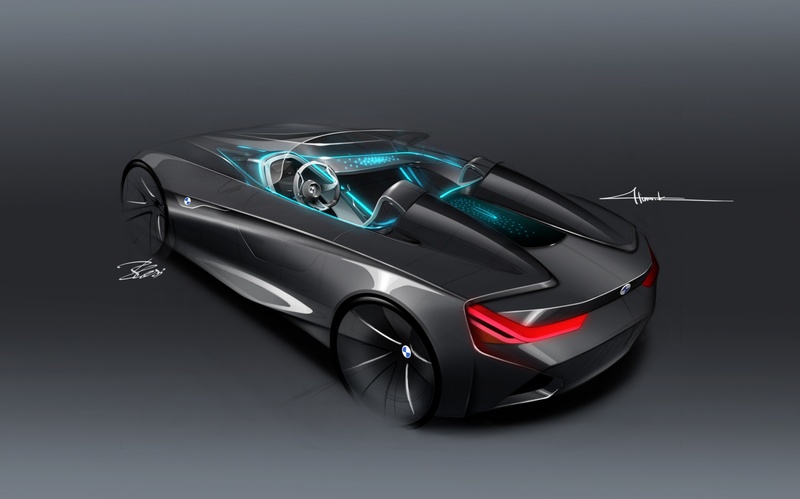 This capability makes the Passenger Information Display in the BMW Vision ConnectedDrive an extremely important feature and illustrates the interconnecting BMW ConnectedDrive philosophy in detail. Here, information, music or address details for the navigation system can be researched by the passenger during the journey and then passed on to the driver. 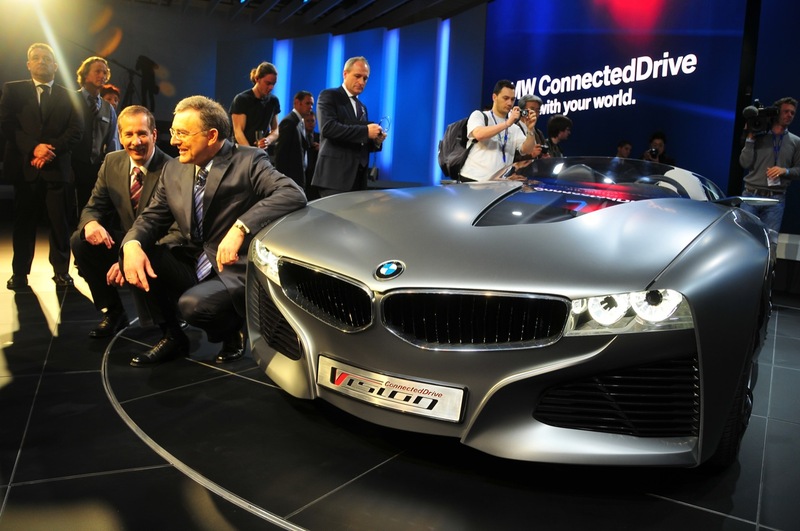 The passenger interface is operated via a touch-sensitive surface located just below it and controlled by gestures. Points of light in the conductive cover of the instrument panel react to each and every touch and provide feedback on the interaction between the passenger and the vehicle. The geometric separation of operating surface and display into two layers ensures optimum operating characteristics. The operating element, located on the lower layer reaching towards the passenger, is optimally accessible. The display is located above it and is further away to optimise viewing. When inactive, the display disappears into the homogenous surface of the instrument panel and is invisible. The integration of operating surface and display into layers and corresponding surfaces gives expression to the special philosophy of functionality of the layering design: form and surfaces are functional and in this case serve as display location and operating surface. Emotional Browser – surfing the reality. A special feature of the passenger display is the Emotional Browser: an emotional, virtual gateway to information enabling the occupants of the vehicle to familiarise themselves with the immediate environment by means of information presented in a magazine format. The passenger can simply browse, highlight or exclude topics of interest by means of filters, thus creating a completely new means of access to information – emotional and intuitive. The Emotional Browser therefore meets two criteria. One the one hand, it expands the passenger’s awareness with additional information on the environment and on the other hand it functions as a filter, allowing only desired or relevant information through. Various (semantic) filters allow the flood of information flowing through the Emotional Browser to be specifically filtered and allow access to the information available according to the interests of the users. Thanks to information provided by the Emotional Browser, a building you might have driven past unnoticed, you now discover to be a museum with a rich history that is currently hosting an interesting exhibition. Information from the Data Cloud and from the location-based services connected to the Emotional Browser allow this data to be used to a greater degree, for instance for navigation to the newly-discovered restaurant, for buying tickets to the current exhibition or for an audio-visual city tour. BMW ConnectedDrive – in touch with your world. The origins of Connected Drive. 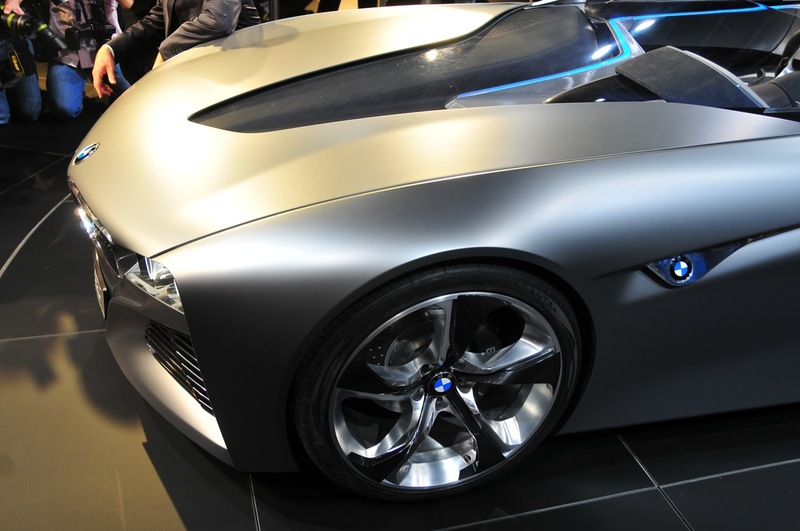 As a pioneer in the field of automotive electronics BMW started at the beginning of the 1970s to develop technologies and innovations to acquire information for the driver from the environment, thereby raising the level of active safety. Major milestones resulting from this research work were chassis control systems such as the braking control system ABS (1979), the automatic stability control system (plus traction) with braking intervention (= ASC+T, 1989) and the dynamic stability control system (= DSC, 1999). 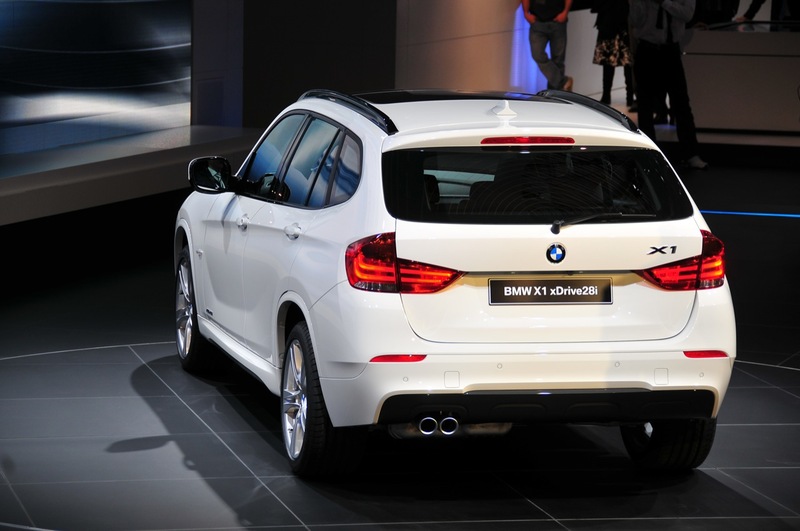 Today, BMW ConnectedDrive systems such as the Rear-End Collision Warning System with Braking or the BMW Night Vision System with Pedestrian Recognition extend the active safety of BMW vehicles and make an important contribution to accident prevention. Above and beyond these, driver assistance systems like the Active Cruise Control with Stop & Go feature or the Parking Assistant add a great degree of comfort to car ownership. 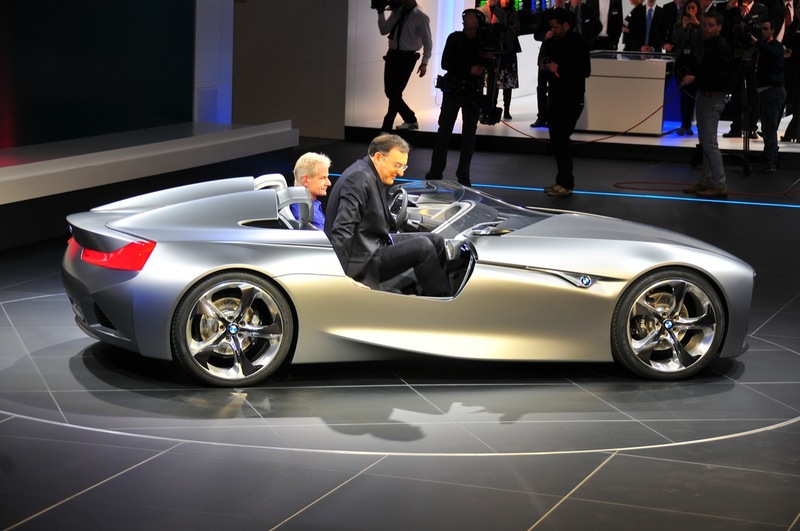 The basis for these and many future developments is the interaction between the vehicle and the environment. 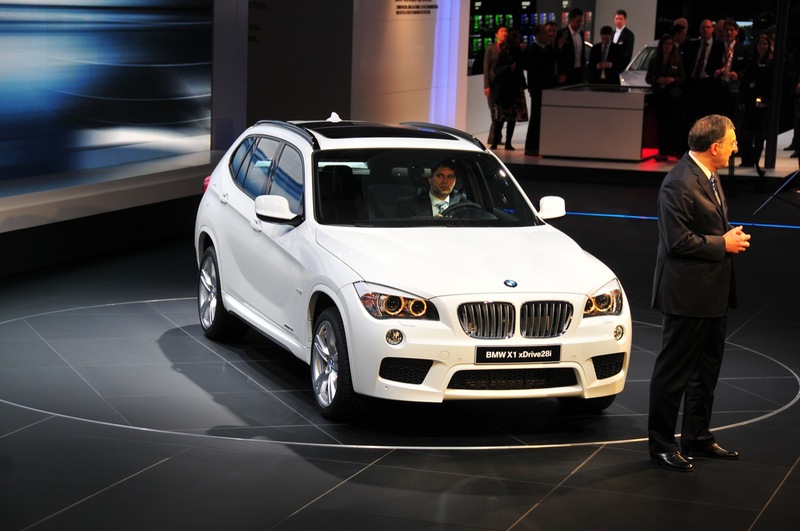 Intelligent sensors monitor the surroundings and are able to recognise objects such as other vehicles and pedestrians. 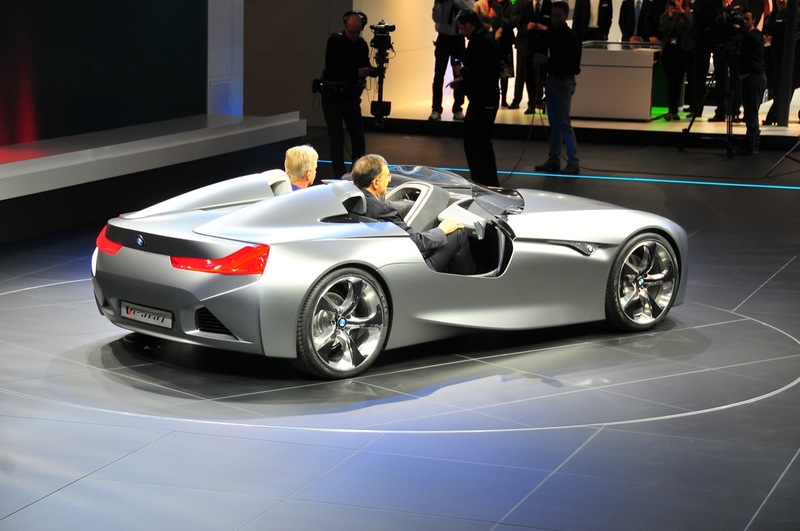 The BMW engineers have not just developed safety systems. 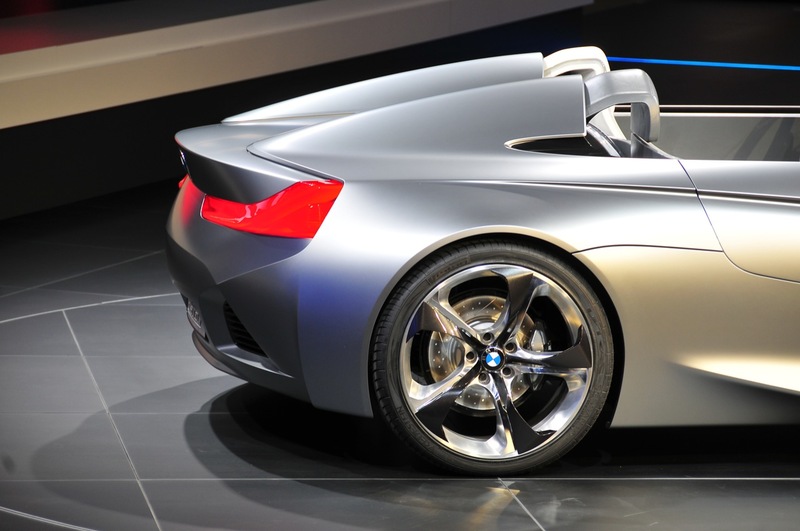 Over the years, the BMW Group has succeeded in widening its technological lead in innovation with numerous pioneering driver assistance and comfort-enhancing systems. After the introduction of the first onboard computer with an external temperature sensor (1980) and the first parking distance control system in the world (1991), BMW began fitting the first integrated navigation system in Europe in 1994. 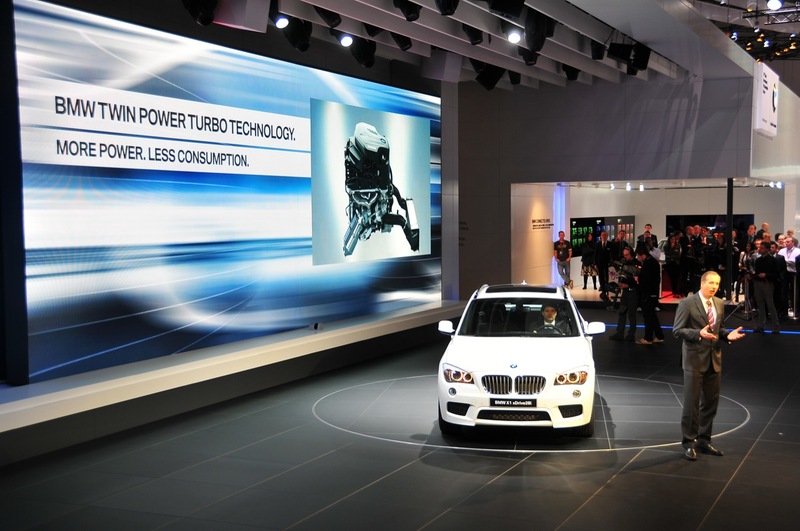 This laid the foundation stone for networking the vehicle with the environment and thus for BMW ConnectedDrive itself. 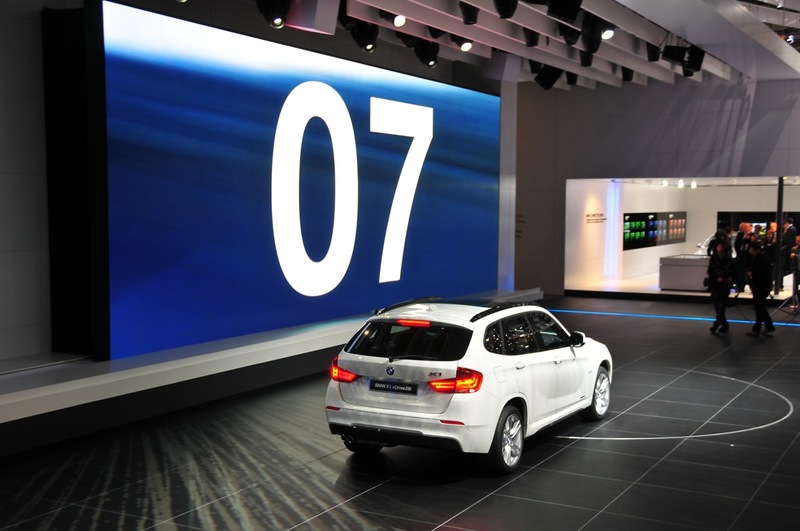 The mobile telephone connection between the vehicle and the Service Centre allows the use of larger, more up-to date quantities of data in the automobile, from which sprang the multitude of informative and useful BMW Assist services. Officially, the term “BMW ConnectedDrive” made its debut in 1999 at the International Automobile Show (IAA) in Frankfurt. 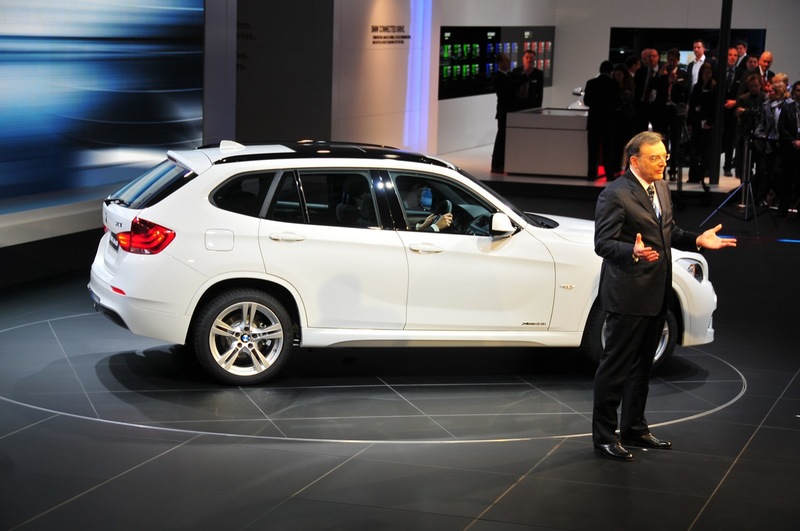 In addition to a number of research and development topics, he newly available BMW Assist features of Information Service, Emergency Call (something that was new in Europe) and Traffic nformation were presented there. 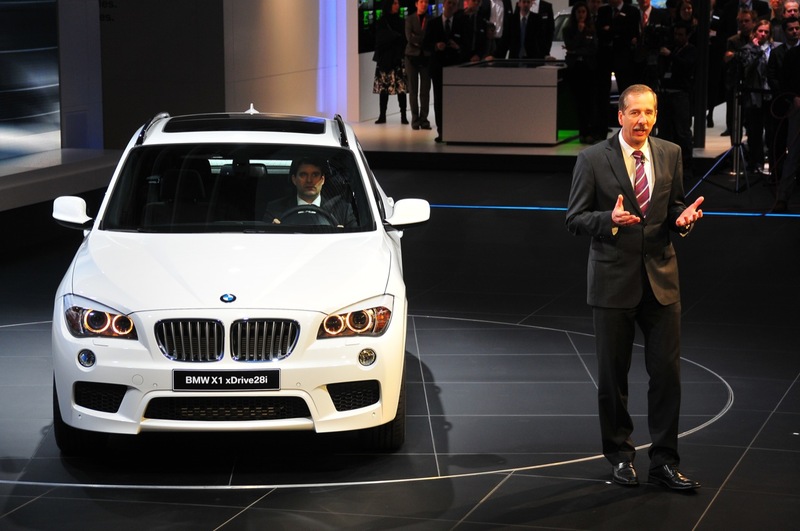 In 2003, BMW ConnectedDrive Teleservices set new standards in terms of maintenance convenience and efficiency. As early as 1980, the first deployment of telemetry allowed BMW racing engineers to follow in real-time the events taking place within the car, wirelessly from the control room, and placed them in a position to quickly identify any emerging problems. Now, based upon this pioneering technology, your BMW knows itself when a maintenance appointment is necessary and will rapidly forward the relevant data to the BMW Service Department in the event of a technical fault. If necessary, BMW Service personnel can access the vehicle’s electronics and can immediately rectify certain problems remotely. 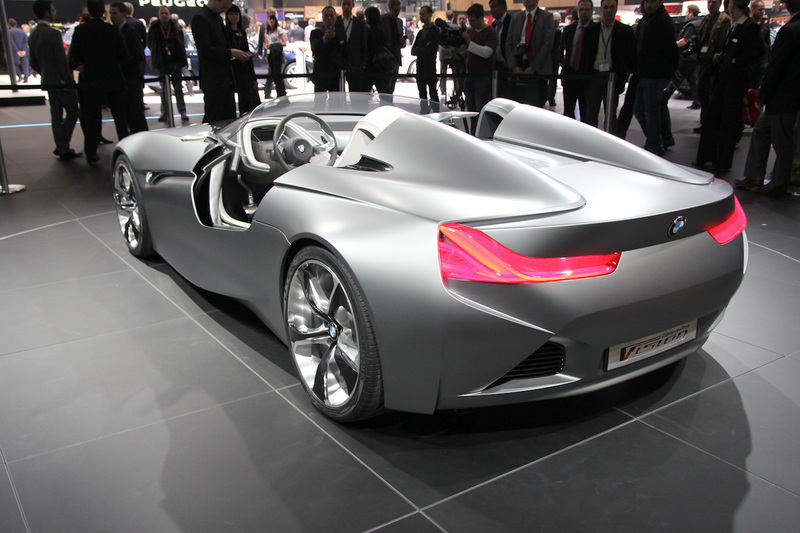 The constantly growing portfolio of products also included the cream of Infotainment. 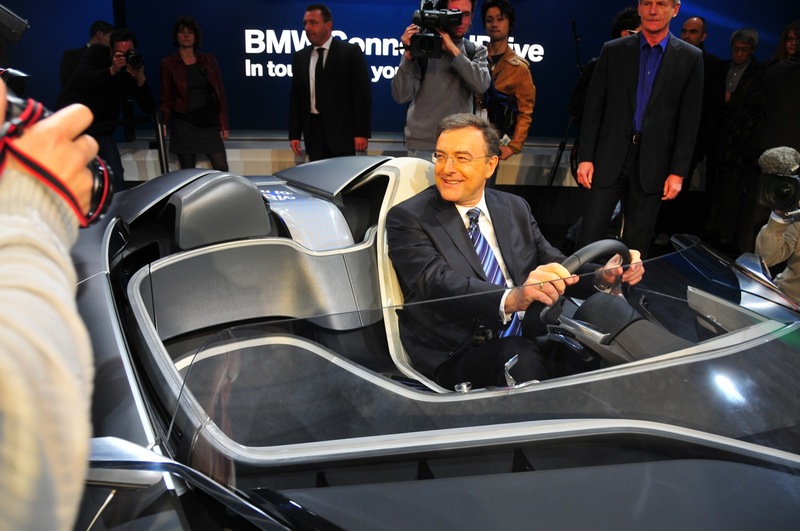 In 1995 BMW became the first automobile manufacturer to offer nboard television. 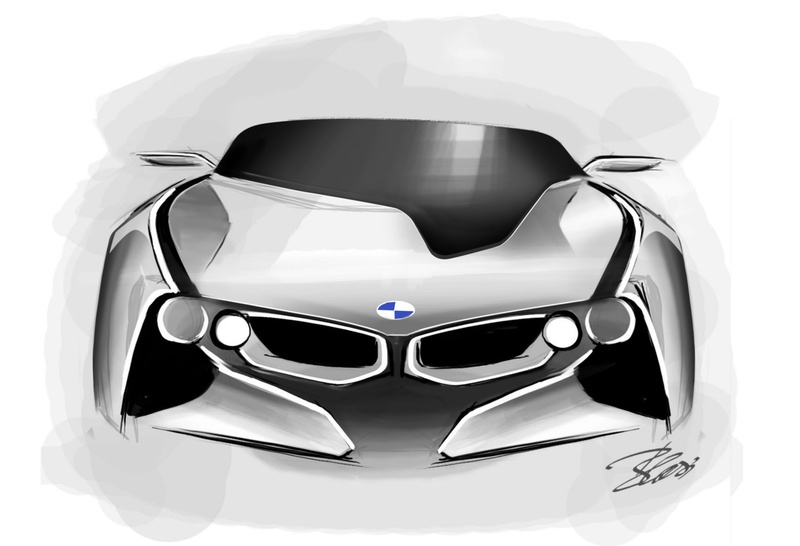 In 2001 BMW Online became the first Internet-based vehicle portal on the Web and in 2004 BMW introduced the world’s first fully integrated iPod interface in a vehicle. 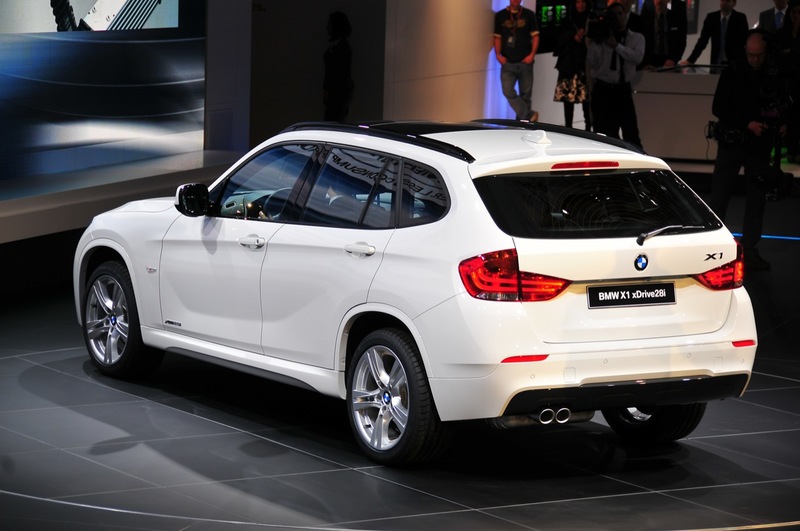 Since 2008, as the first automobile manufacturer to do so, BMW has provided freely available, fully integrated Internet access in the vehicle. 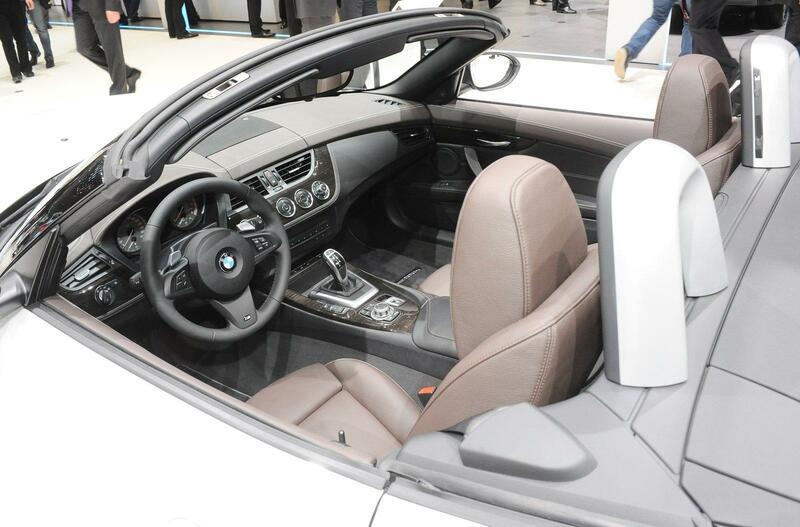 Right here, right now: perfect networking for more comfort, infotainment and safety. 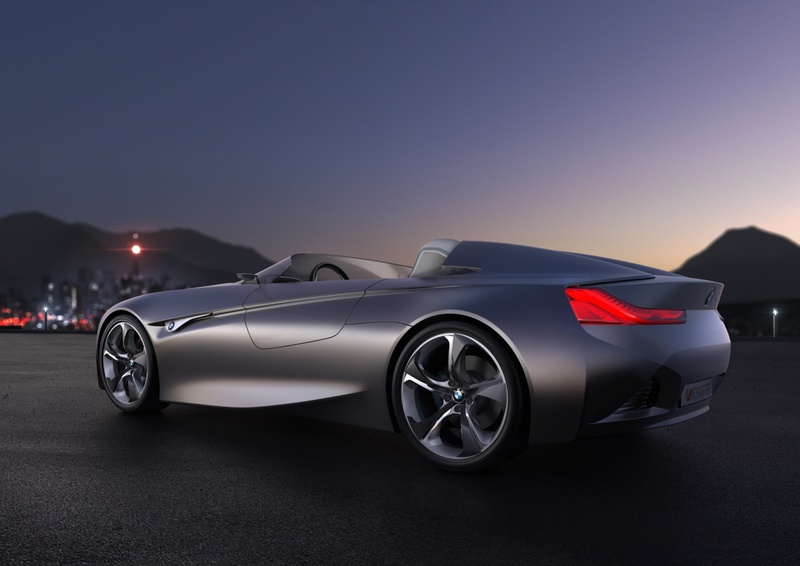 Today, the BMW ConnectedDrive philosophy encompasses all of the innovative functionality and features that are technically based upon the networking of the driver, the vehicle and the outside world. This unique portfolio of innovations addresses comfort, Infotainment and safety and thus driving pleasure. 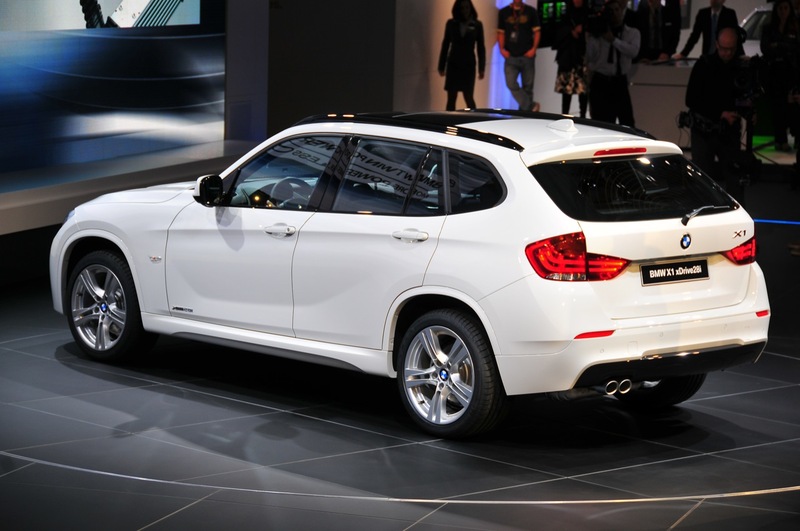 A multitude of features are available for each vehicle series and for each automobile. These include the telephone-based Information Service with data transfer to the navigation system, the import of routes to the navigation system via the mobile telephone network or via a USB interface, the camera-based Traffic Sign Speed Limit Recognition System as well as the Emergency Call, which reports the vehicle’s precise location so that the emergency services can quickly be guided to the scene of an accident. 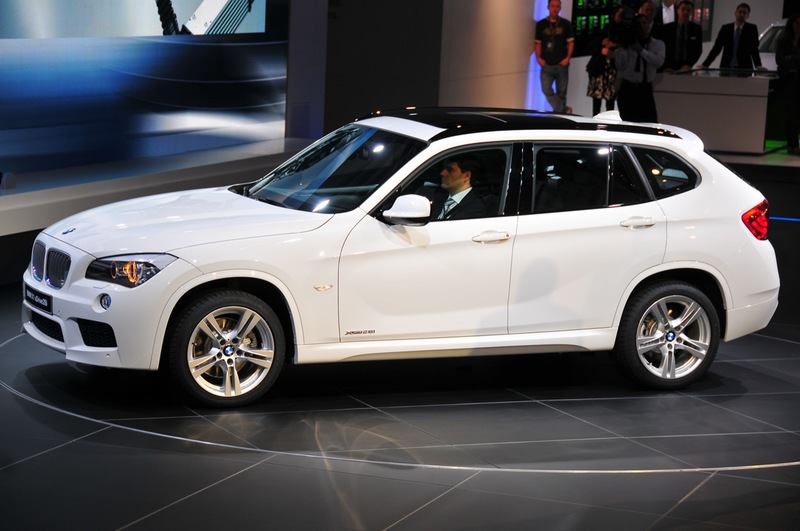 Comfortable driving and vehicle handling – the vehicle as the perfect travel manager. 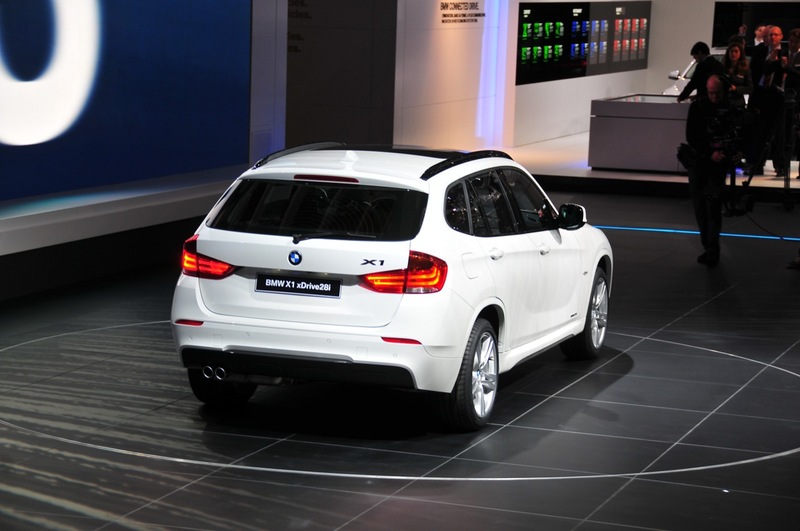 The integrated navigation system has been guiding BMW drivers reliably to their destinations since 1994. 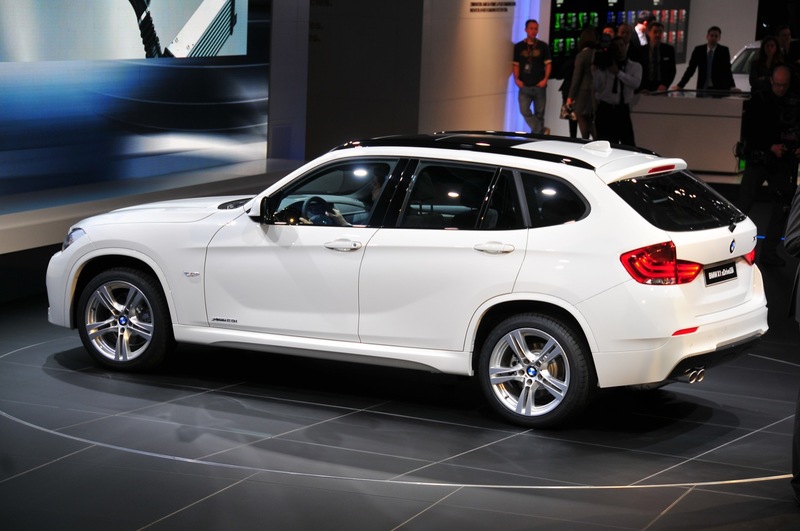 Today, a navigation system offers a lot more than simply the ability to get to your destination and the services provided by BMW ConnectedDrive offer numerous helpful features in addition to pure guidance. 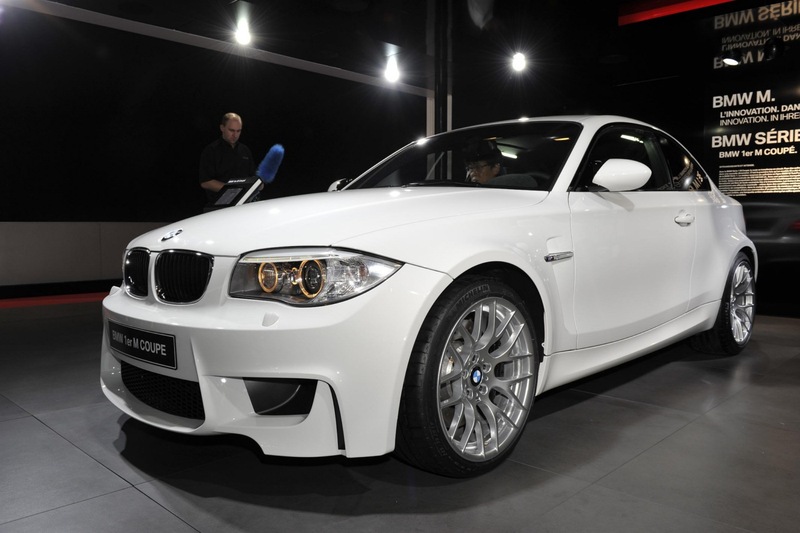 During the journey, the Information Service provided by BMW ConnectedDrive acts as a virtual co-driver, locating restaurants, sights and other points of interest (POIs) and sending the respective addresses to the navigation system. It is even able to make reservations. On the road, Real Time Traffic Info, going into series production in 2011, keeps the driver abreast of the current traffic situation on the busiest roads – motorways, main roads as well as roads and side roads in towns – in real-time. Thus traffic jams are a thing of the past. As soon as traffic congestion sets in, it can be avoided. 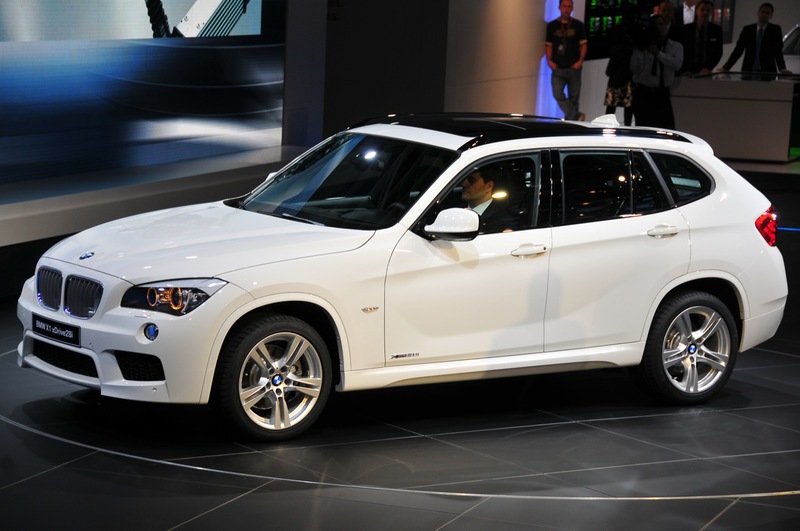 Shortly before reaching the destination, functions available in all BMW automobiles since 2010, i.e. Google Panoramio and Street View, make actually finding your destination much easier. They show you actual pictures of your destination, downloaded online during the journey. 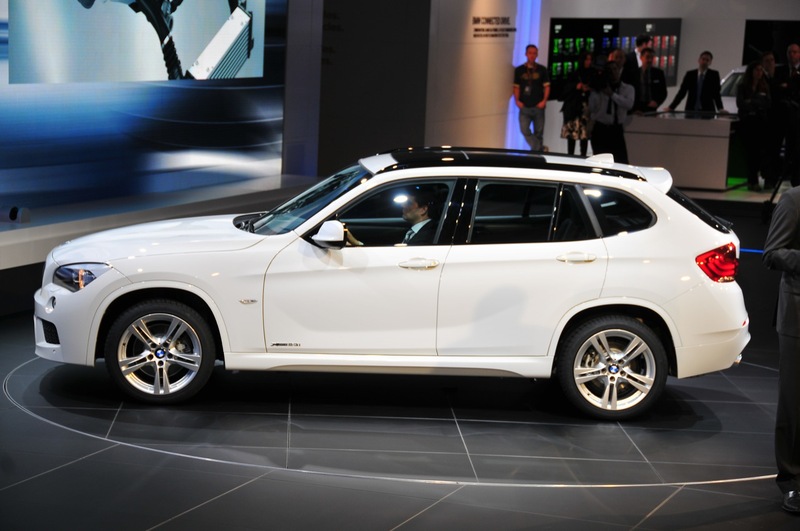 All of these comfort-enhancing features from BMW ConnectedDrive turn the vehicle into a perfect travel manager, keeping the driver in touch with his environment during the journey and supplying him with important information. 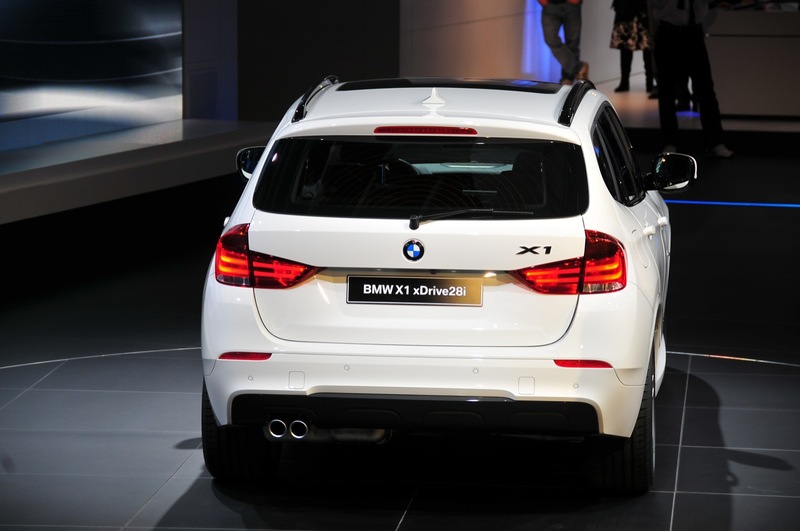 Infotainment – a powerful combination of information and entertainment in the Vehicle. 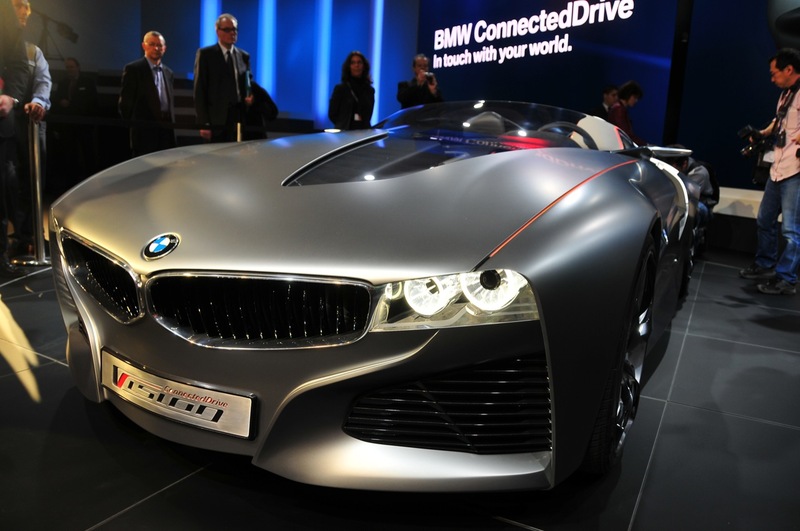 With the integration of smartphones, USB interfaces, Bluetooth and Internet access BMW ConnectedDrive has already transformed the vehicle into part of the digital world. 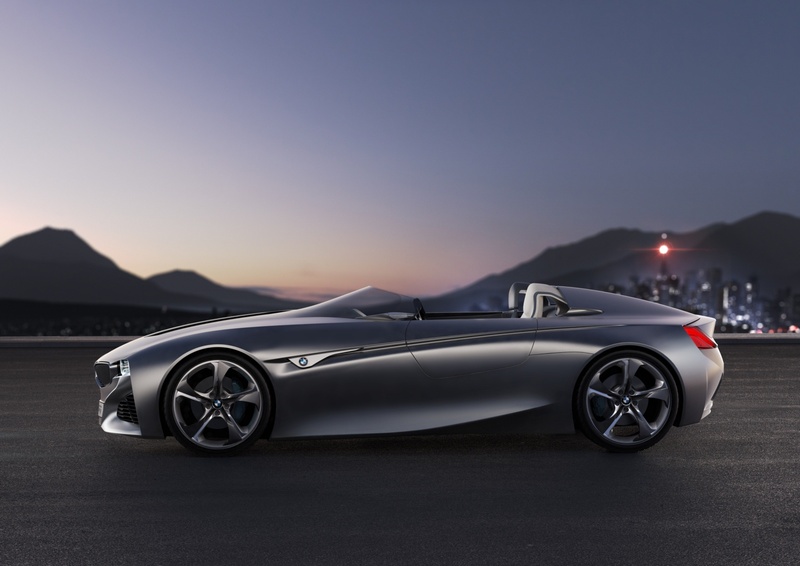 But only since the introduction of BMW ConnectedDrive’s intuitive operating logic and the well thought-out display concept can the full spectrum of features be enjoyed, ergonomically and distraction-free. From 2011 onwards, access to Facebook, Twitter and Web Radio can be optimally integrated into your BMW with the iPhone App “BMW Connected”. LATEST NEWS! 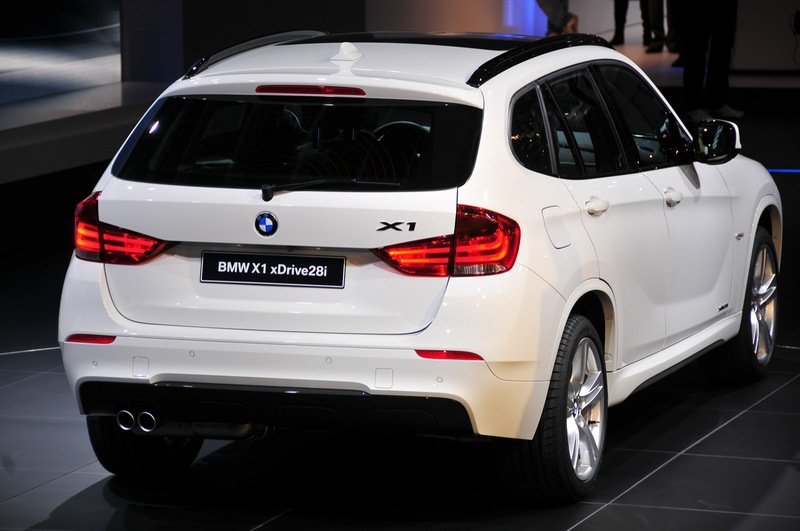 BMW now offers a new interface for iPhone integration into the vehicle. From March 2011, a new vehicle entertainment feature will be available which uses Apple’s iPod Out. 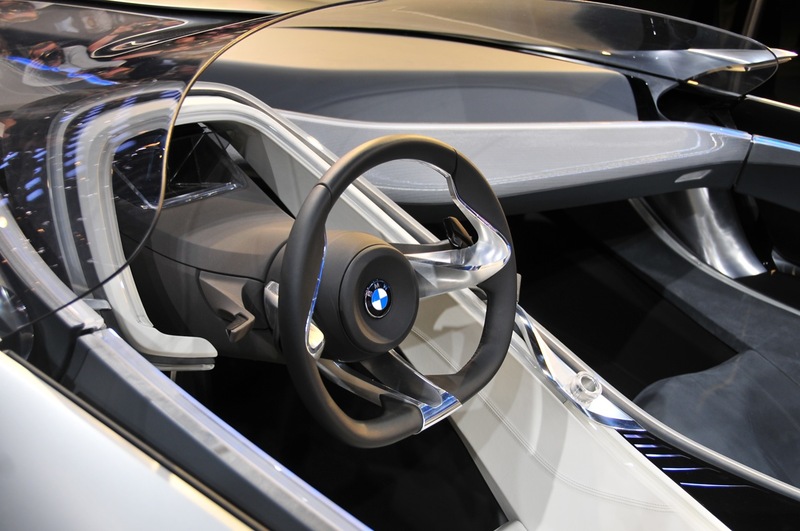 This is a further BMW ConnectedDrive innovation, which in typical BMW style can be operated via the iDrive Controller, minimising distraction for the driver. The newly developed interface technology offers easy, familiar operation – something that the driver is used to from the iPhone and iPod. 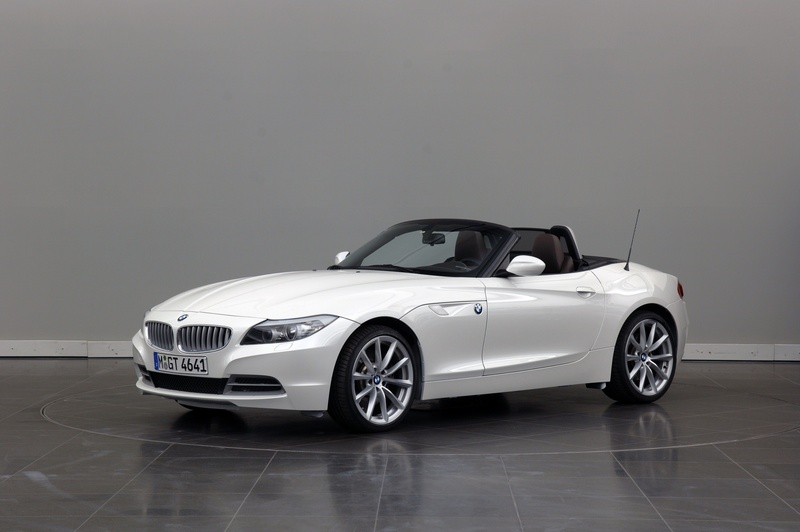 The vehicle screen gives the BMW driver direct access to the latest iPod features such as Genius, which allows the driver to automatically generate playlists with songs that fit nicely together from his music library. All of the stored playlists are shown with the original album covers – just like on the iPhone and iPod. 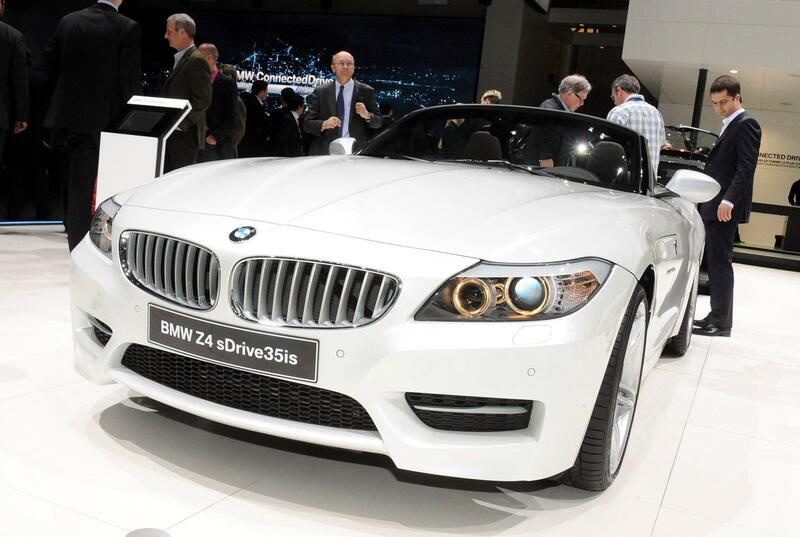 BMW underscores yet again its impressive lead in the Infotainment area. 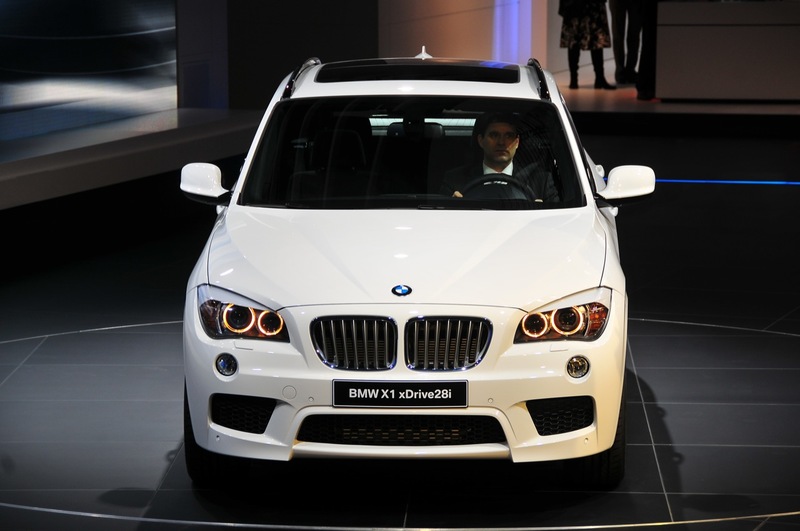 The optimised display and operating features of BMW ConnectedDrive for playing music support the iPhone 3G, iPhone 3GS and iPhone 4 running under iOS 4.2.1 and higher. 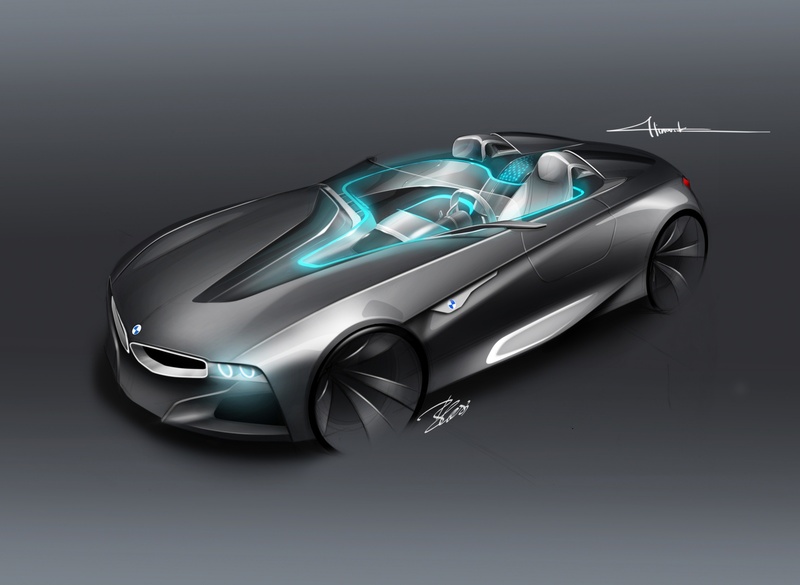 Since the software on the user’s iPhone allows the use of the various BMW ConnectedDrive features, functionality can be continuously expanded and tailored by software updates, guaranteeing the long-term use of current and future iPhone features. 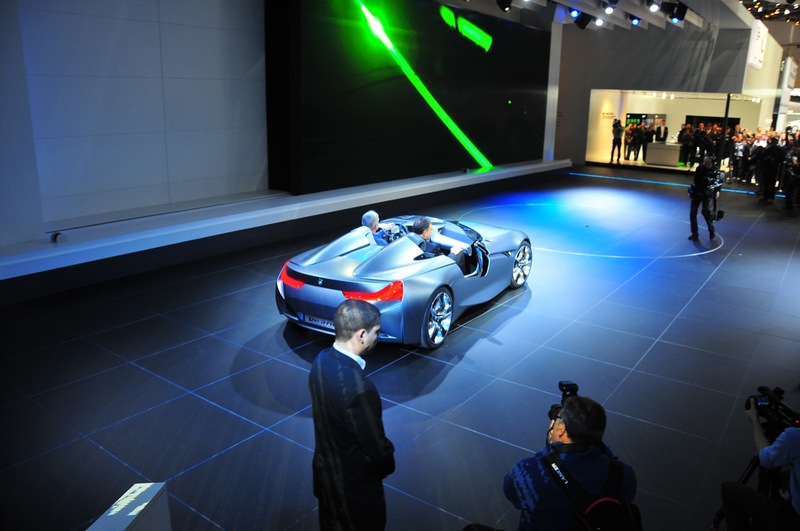 This is the beginning of a new era in the integration of consumer electronics into the vehicle. All that is required for this comprehensive integration is a snap-in adapter with an USB/audio interface and the special “Apps” option from the BMW range. This new feature is currently available in Europe, USA, Canada, Turkey, South Africa, New Zealand for the BMW 7, 6, 5, 3, and 1 Series Coupes and Convertibles, the X5, X3, X1 and Z4. Availability will be expanded in stages. Safety – recognising dangers at an early stage and avoiding accidents. Intelligent chassis control and driver assistance systems are the best means of protection an automobile manufacturer can place at the disposal of his customers to avoid accidents. The sad fact is that the cause of most accidents is human error. For this reason, the safety-relevant innovations delivered by BMW ConnectedDrive significantly extend the driver’s capacity to deal with and react to critical, confusing situations on the motorway or in heavy traffic in order to avoid an accident entirely or at least to minimise its effects. 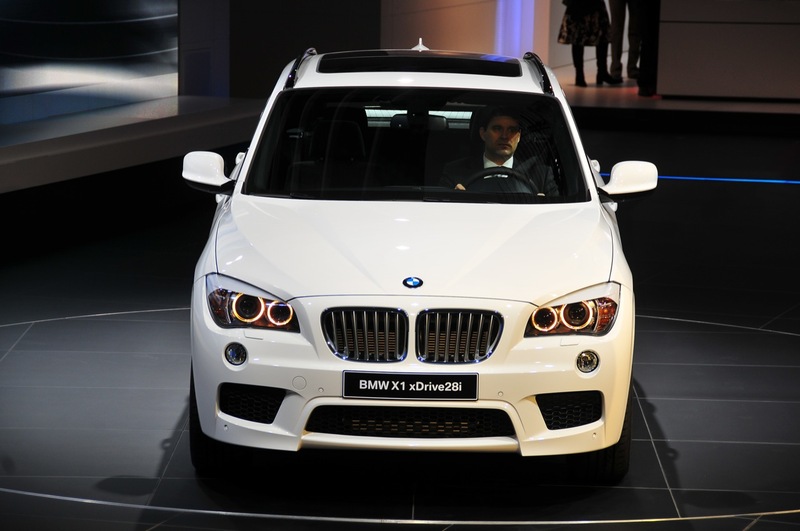 Driver assistance systems such as the Head-Up Display or the BMW NightVision System already provide a distraction-free picture, expand awareness and make a great contribution to safety. At the moment the BMW Group is researching safety systems with a greater level of automation, which – if necessary – will be capable not only of automatic braking but which will also be able to take evasive action. But in the face of all of the automatic functionality, the driver must remain – also in future – in command of his vehicle and e in a position to override system intervention. When complex decisions need to be taken, man cannot always be adequately replaced by machine. 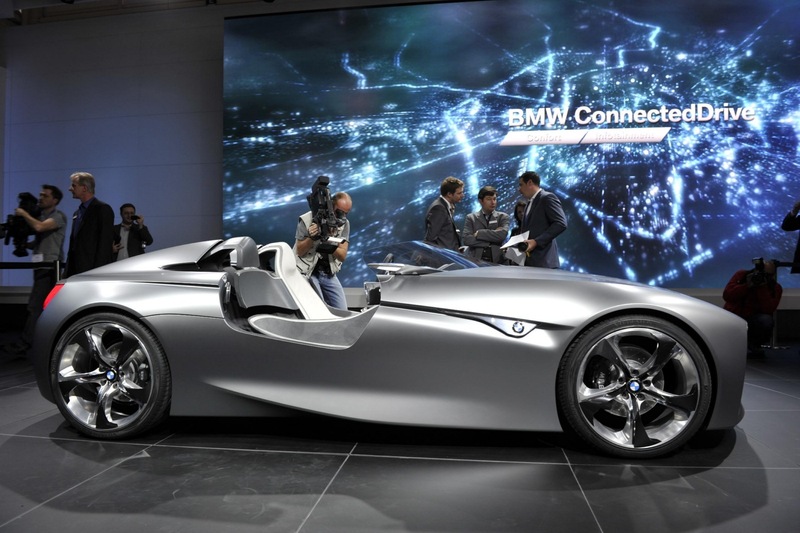 What about the future of BMW ConnectedDrive? 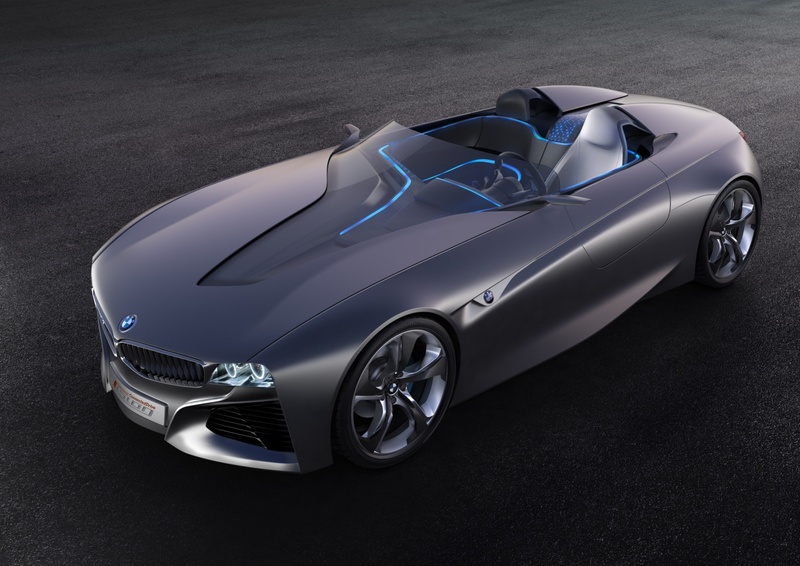 As the BMW Vision ConnectedDrive demonstrates, in future, the automobile will become a highly integrated and perfectly natural part of the networked world. 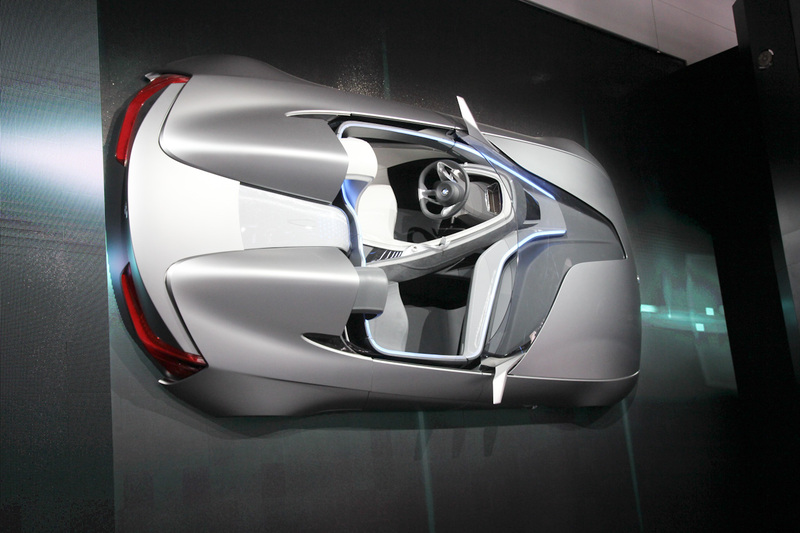 The networking functionality will not only simply make the connection of the vehicle to the outside world, but will provide the most intelligent networking possible. Ingenious, needs-oriented solutions, which filter and sort, will make the difference. Because in future, you will be able to be online all the time, almost everywhere. Connectivity will not need to be switched on, it will simply be there. The world’s data will be accessible at any time, in any place from an omnipresent Data Cloud spanning the planet. Information retrieved from “the outside” will be indistinguishable from data stored locally. The focus is on providing the right information at the right time. To achieve this, data from the most diverse of sources needs to be processed, consolidated and filtered in a targeted, demand-oriented manner. The goal is to provide the driver, the passenger and the vehicle’s systems with optimal information. Sophisticated display and operating concepts assist in finding the required information quicker and more intuitively while displaying only up-to-date and relevant data to the individual. 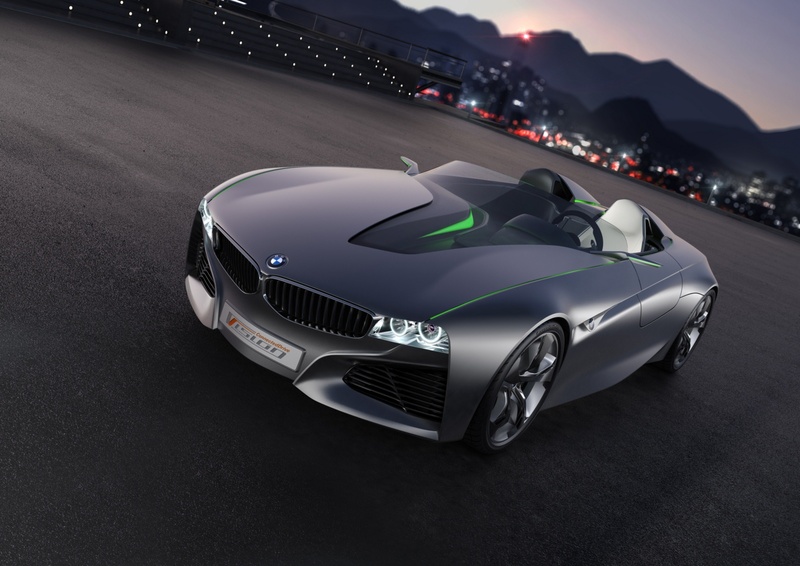 Location-based, mood-based or situation-based services such as the familiar Google Local Search or the Emotional Browser, which is a part of the BMW Vision ConnectedDrive concept vehicle, are just a beginning. They filter information according to the driver’s and the passenger’s requirements and ensure that suitable information is available – in appropriate, individual doses. Networking with the outside world will in future also contribute towards the prevention of accidents involving other vehicles and road users. 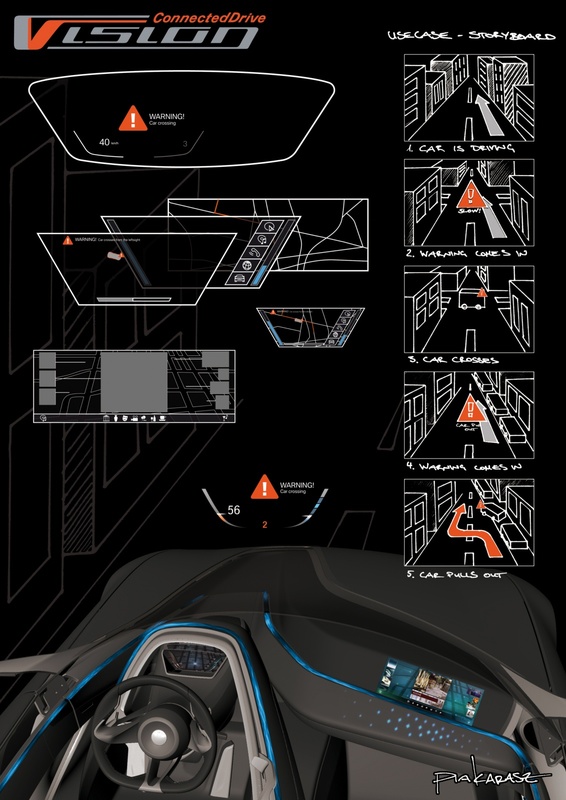 The safety systems presented together with the BMW Vision ConnectedDrive such as the ability to recognise vehicles as yet unseen and the highly automated braking and avoidance system are based upon concrete, on-going research projects such as Car-To-Car Communication or the Traffic Congestion and Tailback Assistant. 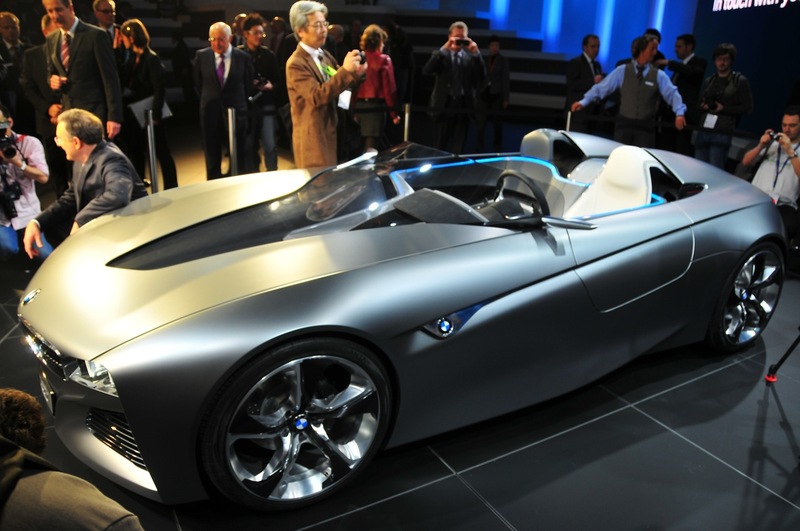 BMW ConnectedDrive has a rich history of innovation and now turns its attention to an undoubtedly exciting future. 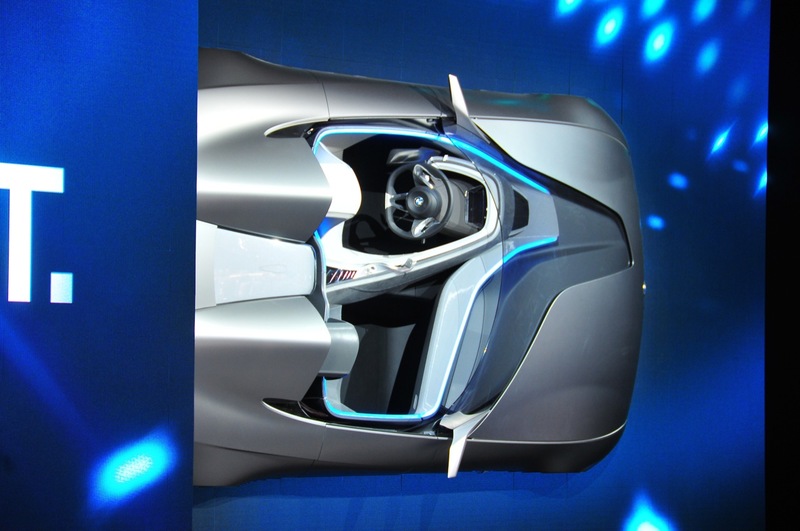 The rapid pace of development in the world of technology provides more and more opportunities everyday to heighten the experiences of Infotainment and comfort but also to enhance safety to an unprecedented degree. 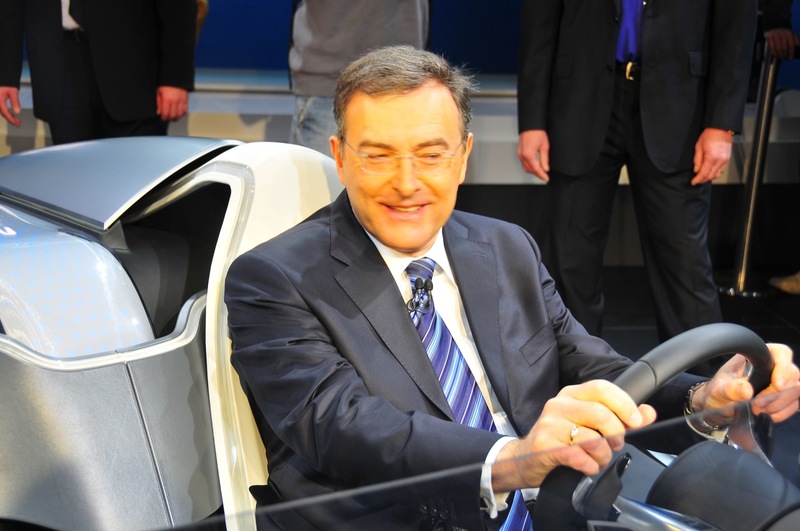 Ten years ago, when BMW ConnectedDrive was in its infancy, people were working on realising fax reception in the vehicle. Today, e mail and text messages have made the fax a thing of the past. 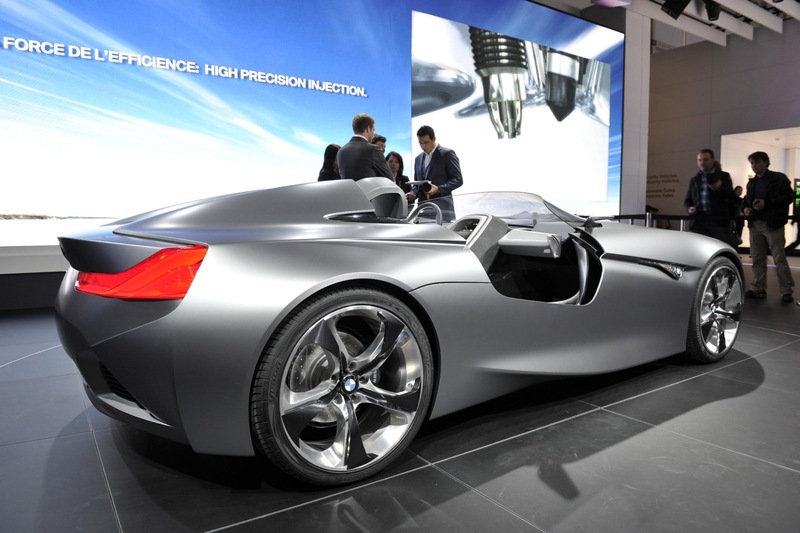 And perhaps in another ten years, everyday life without the functionality featured in the BMW Vision ConnectedDrive today will be unimaginable.